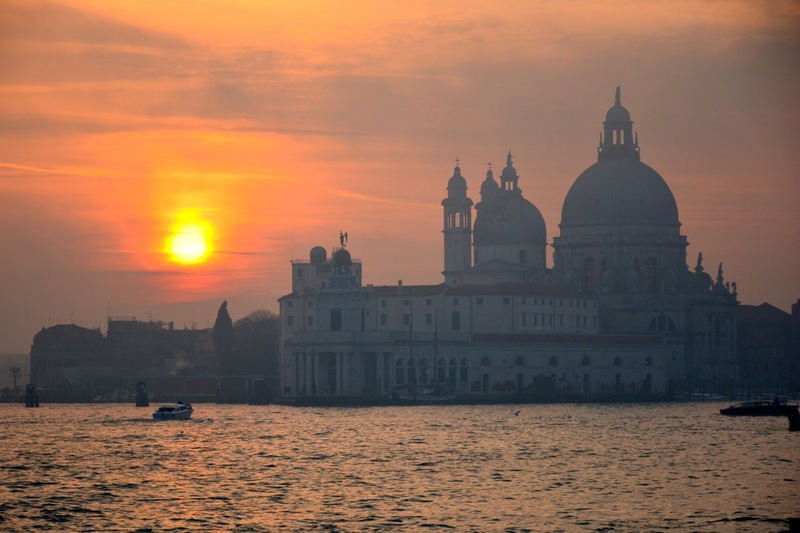 A whirlwind tour of ten cities by Will & Spike…..
Venice. 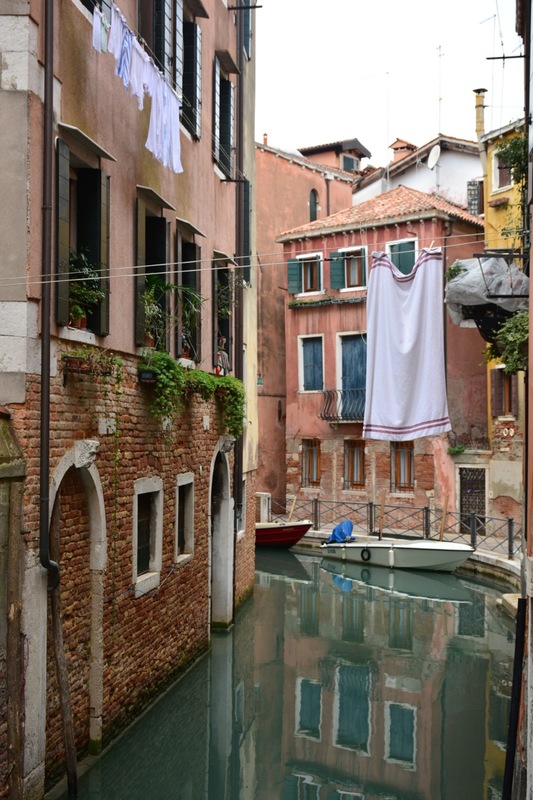 A watery, sunny, lovely, sleepy, windy, yummy city, crammed with festivals, little cobbled alleyways and tiny glass shops fulled to the brim with treasures and gems. 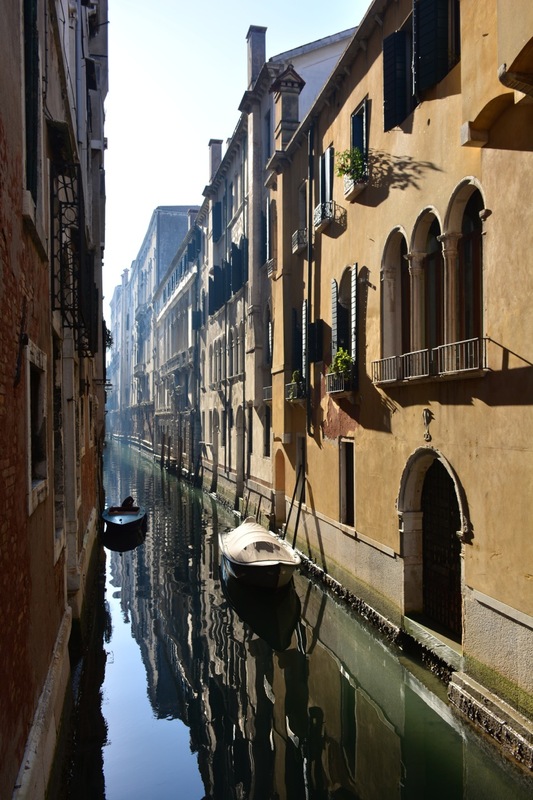 The aqua streets are filled with boats and gondolas. 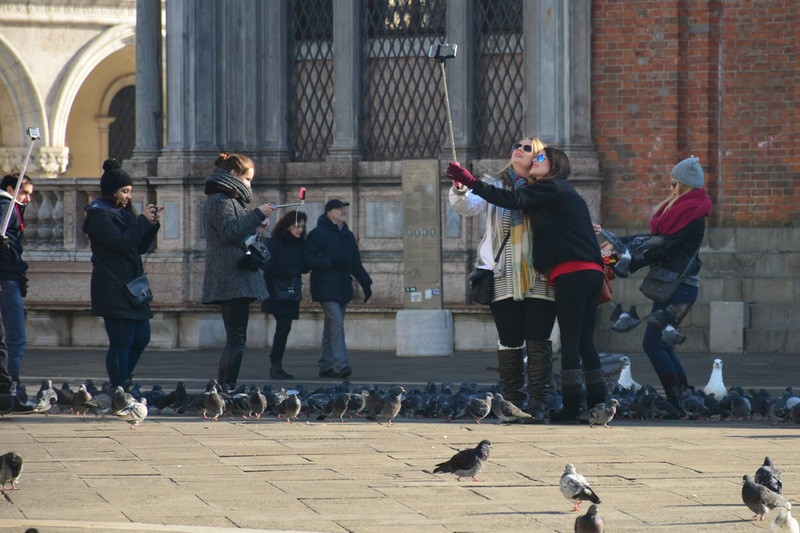 Let’s just say that no one really had any expectations at all for Venice. We looked at it as a resting place after a busy week of skiing. So that meant no pointless wandering, no churches or big old buildings. It meant fun! 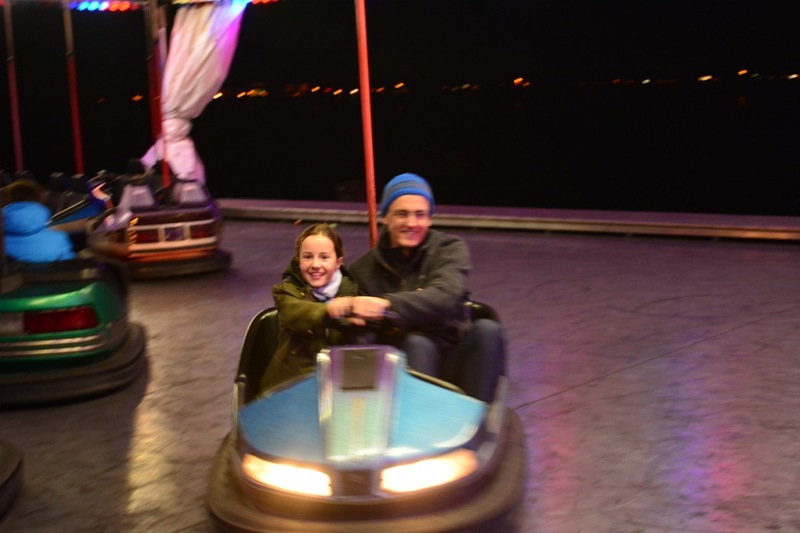 On our first night we walked to the Piazza San Marco and had some fun at the little fair type thing that was near the park. 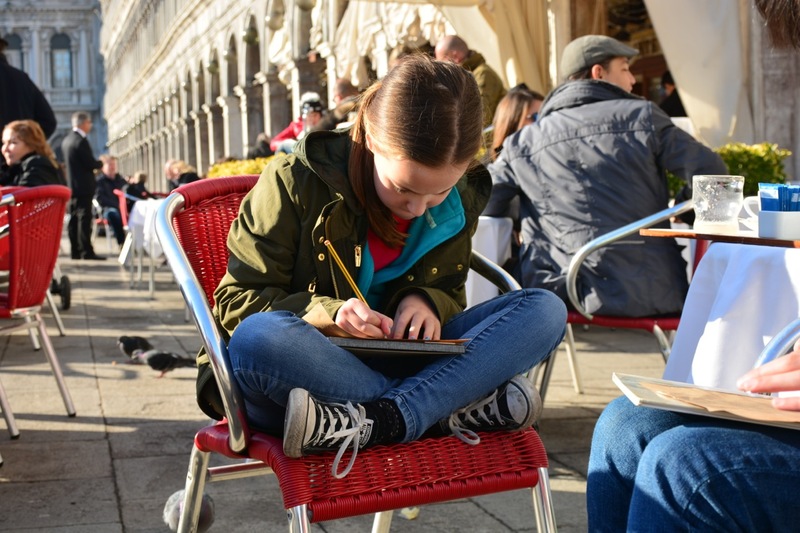 The next day, we (again) walked down to San Marco to draw! We had loads of fun sketching all the beautiful things but not so much fun trying to avoid the thousands of pigeons that were there. (I am not exaggerating.) We had a nice coffee and some biscuits that were way too overpriced-10 euros for a cappuccino! Dad managed to take loads of photos of everyone taking selfies-he even got 3 in one photo!!! 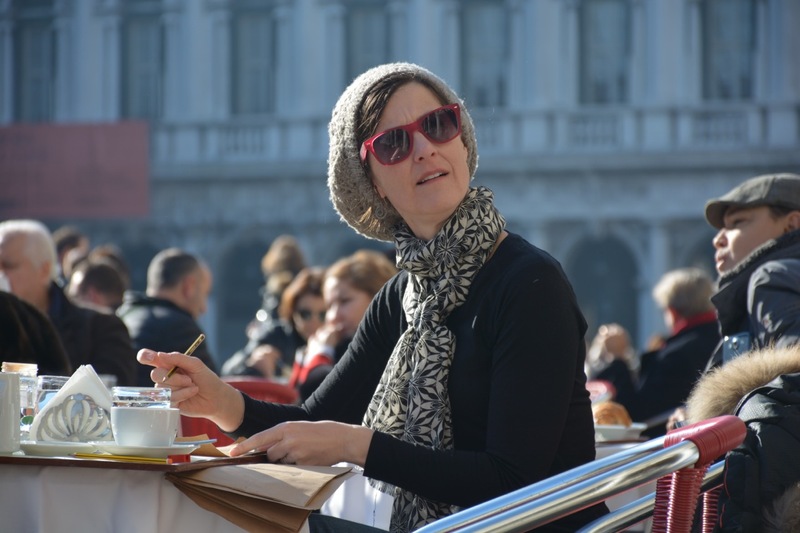 Sketching and the world’s most expensive cappuccino! And a bonus point for a triple hit! 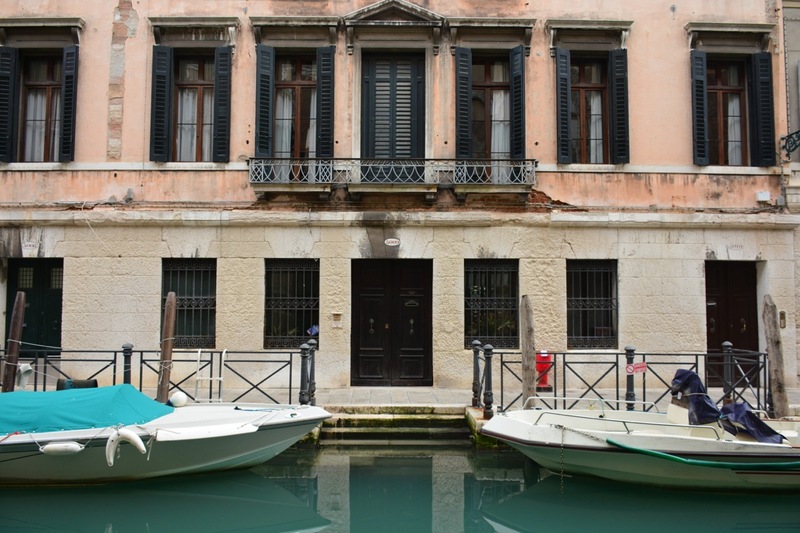 After, we walked to the Peggy Guggenheim museum. A great collection of art is stored in Peggy’s house. We played a fun game where you had to choose your best work of art, your worst and the one you would rename and what you would name it. 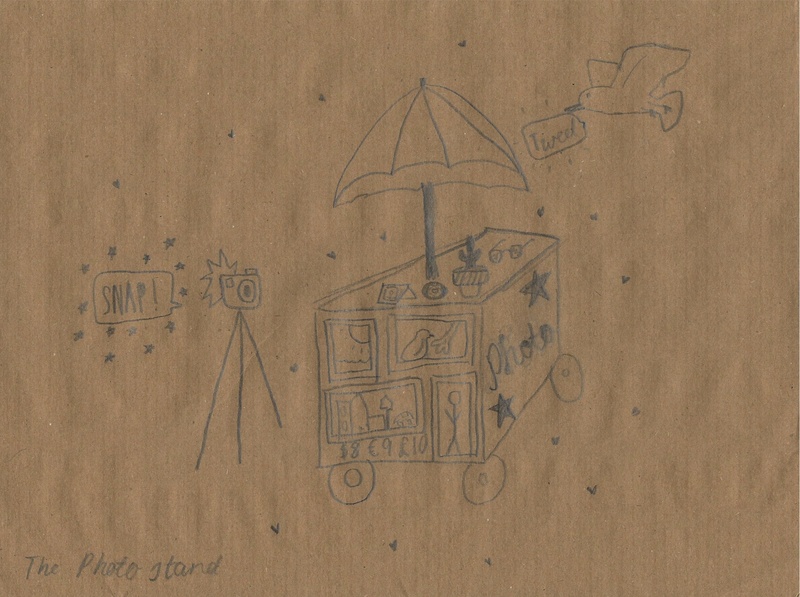 My favourite was “Pharmacy” which was a collection of little jars with trinkets in them, my worst was “Bird in Space” which was a giant copper stick, and the one that I would rename was a wooden statue called “Seated Male Figure Holding In His Hands a Musical Instrument”. Which was exactly what the name suggested. I renamed it Tiki Tiki Voodoo Spirit guy. 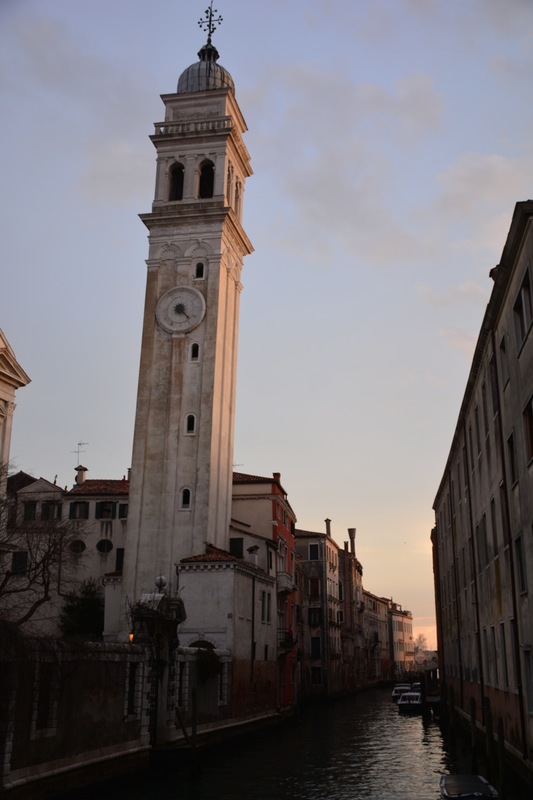 We also caught a Vaporetto to Giardini (the park) and had a play there. 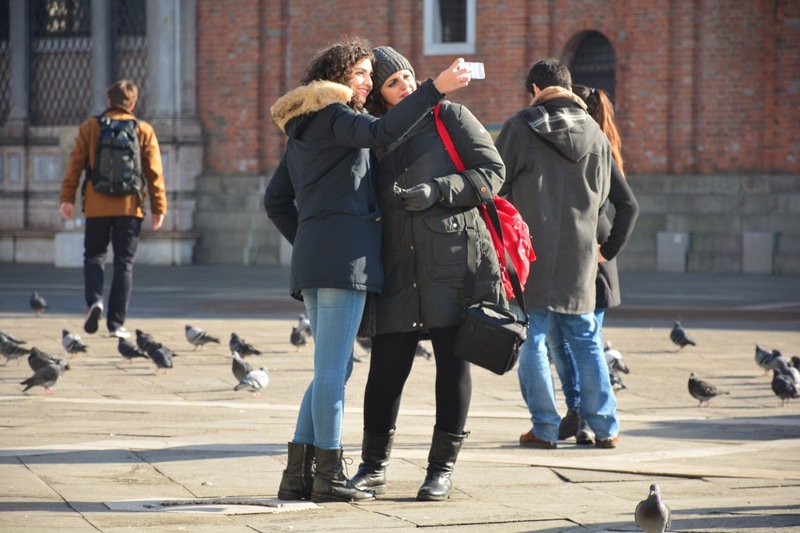 Day 2 – Posting seemed like it was the only thing on the agenda today as we spent 3 hours ( and a million bucks ) trying to use the Italian post system effectively. 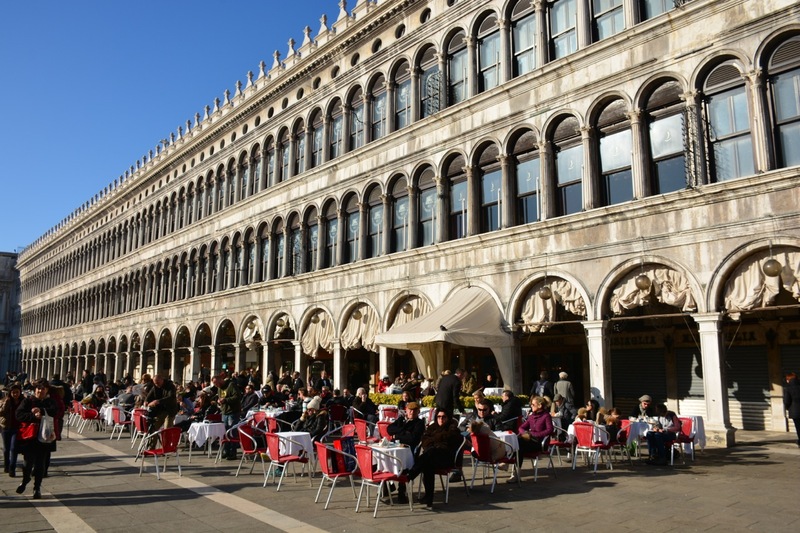 We nearly spent as much as the coffee in San Marco !!! 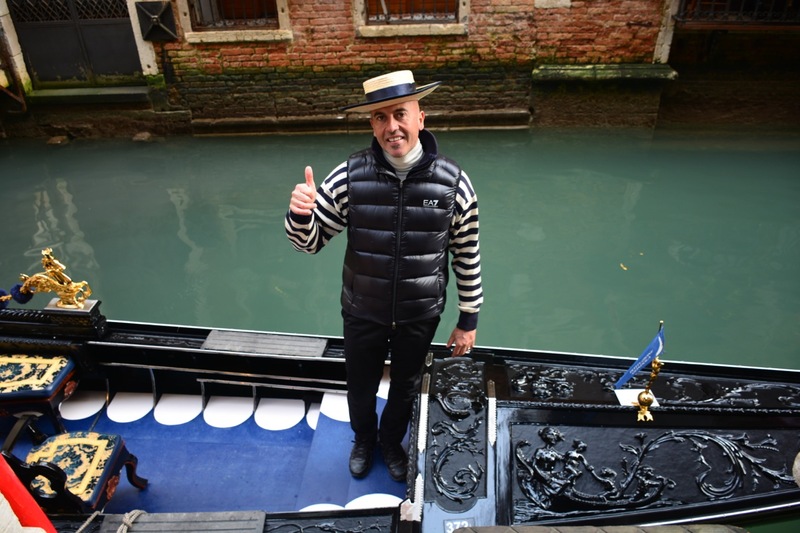 On the way home, we passed one of the regular gondoliers advertising rides in his gondola. 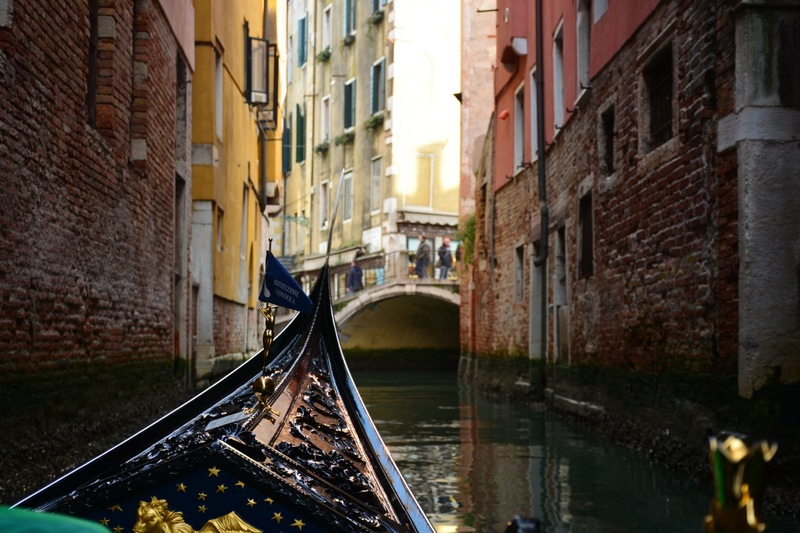 So we hopped in the Gondola and swept off. 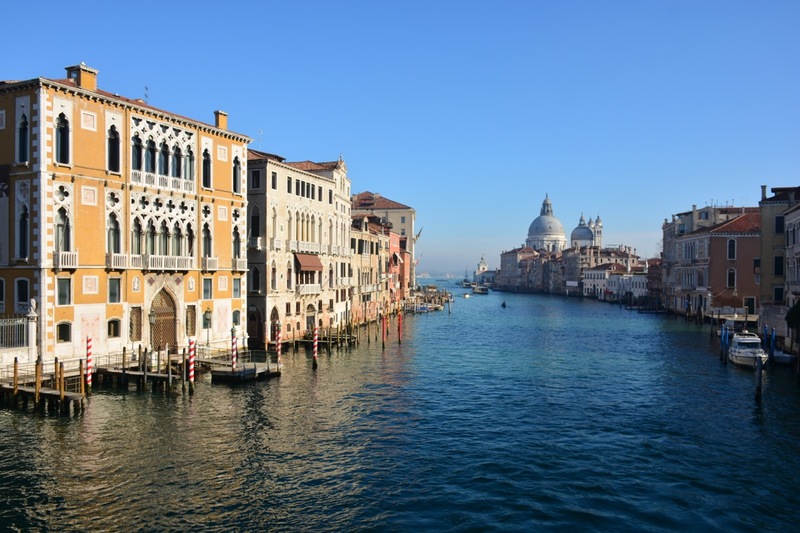 We rode past Marco Polo’s birth place, underneath the Rialto bridge and through many of the salty blue streets for only 3 euros more than the coffee AND the postage!!! 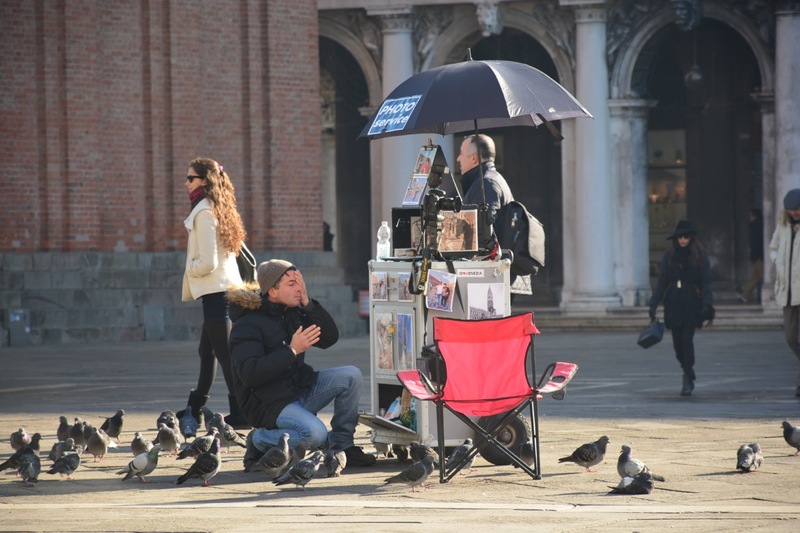 On our last day we played Flip-a-Coin to get lost in Venice. A game where heads is right and tails is left and you go wherever the coin tells you to go. We discovered many new places as well as a very old bookshop which was absolutely jam packed with books. Books in Bathtubs, old gondolas, on the counter and not a shelf to be seen. Mainly because the only one in the store was covered in …… I don’t know, maybe…hmmm…Books?! 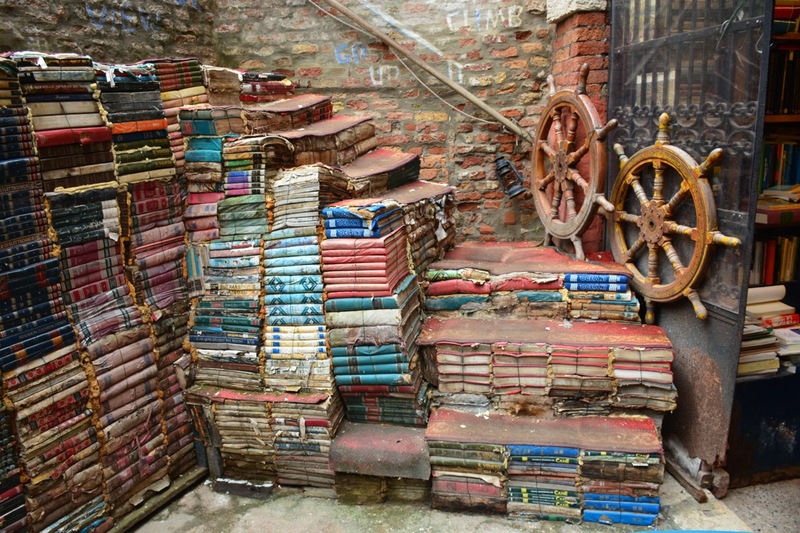 An old and amazing bookshelf we stumbled upon. At lunch, we started filling out a questionnaire about our trip. We thought and talked about all the great things that we had done and seen on our trip. For our last dinner on our trip, we went to a very cute, touristy place just next to one of the many bridges in Venice. 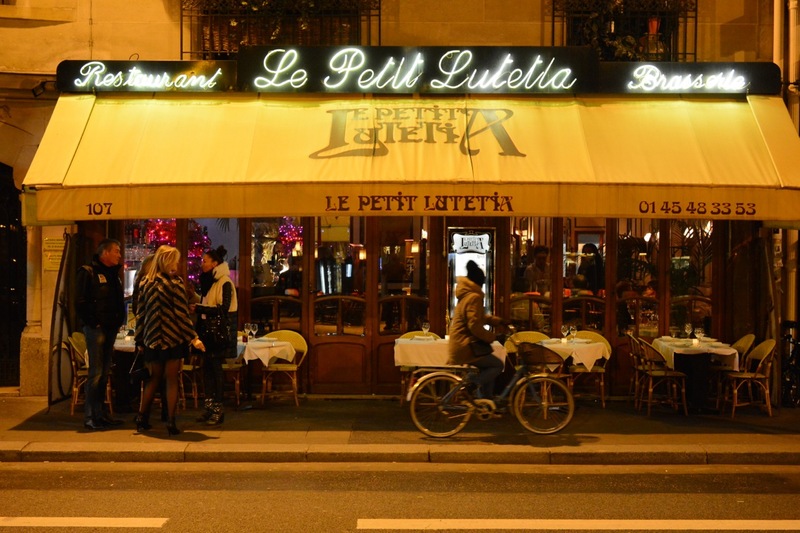 It was very nice and they made the most AMAZING profiteroles! 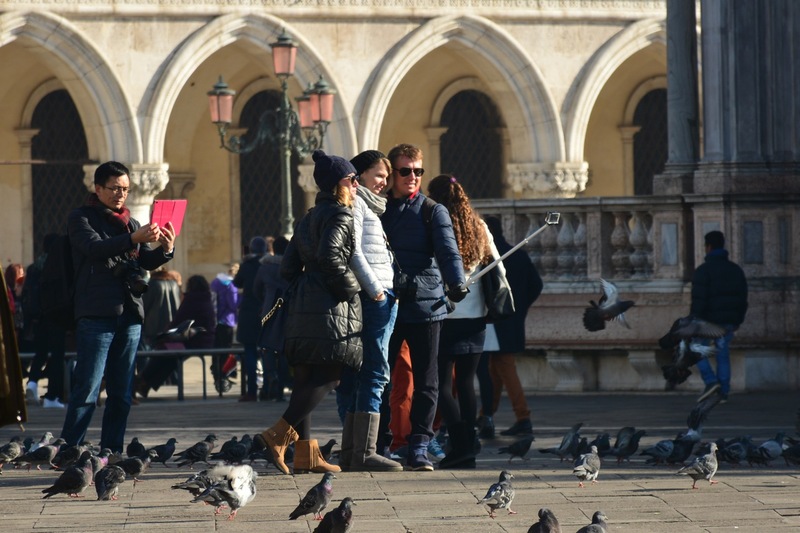 We had loads of fun in Venice ( Thanks Mum and Dad ) and enjoyed it so much. 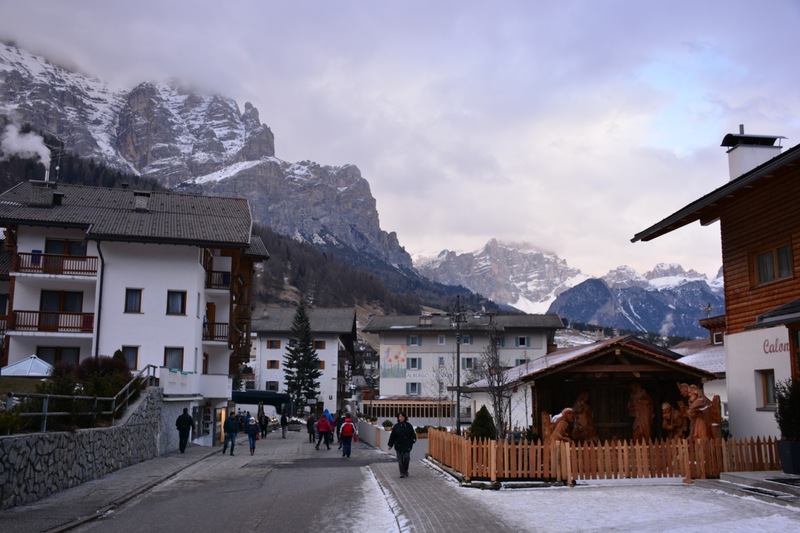 The journey from the airport to San Cassiano wound through the Dolomites, climbing up mountain roads, going higher and higher over each pass. 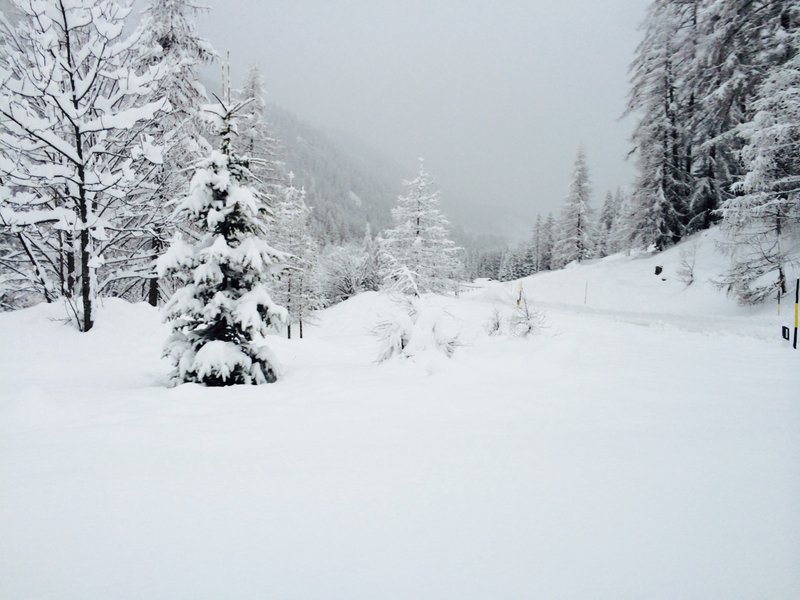 The snow began to fall, the roads got narrower and Heidi, our driver, spent more and more time on the mobile. It turns out she was finding out which of the high mountain passes were passable, and finally after a few calls, she settled in on a safe way over the mountains. 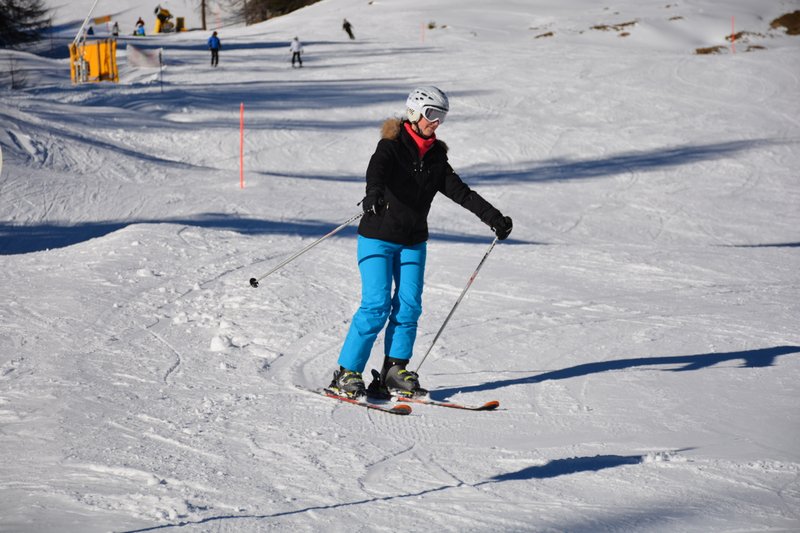 Luckily she was a San Cassiano local and seemed very confident on the snowy and icy roads. 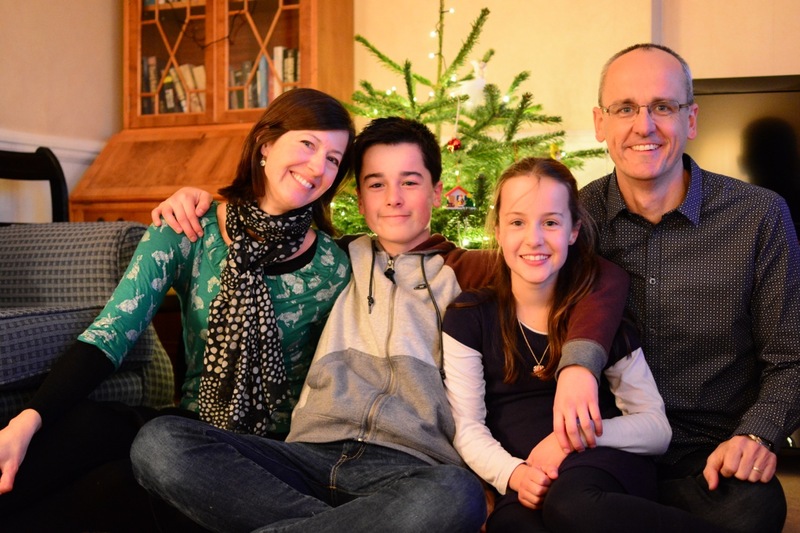 The 4wheatleys are not renowned for their skiing prowess, and with slight trepidation, we collected our ski gear on the afternoon of arrival, wondering what the next 5 days of skiing would bring. Day one broke, with brilliant sunshine and fresh snow up high. 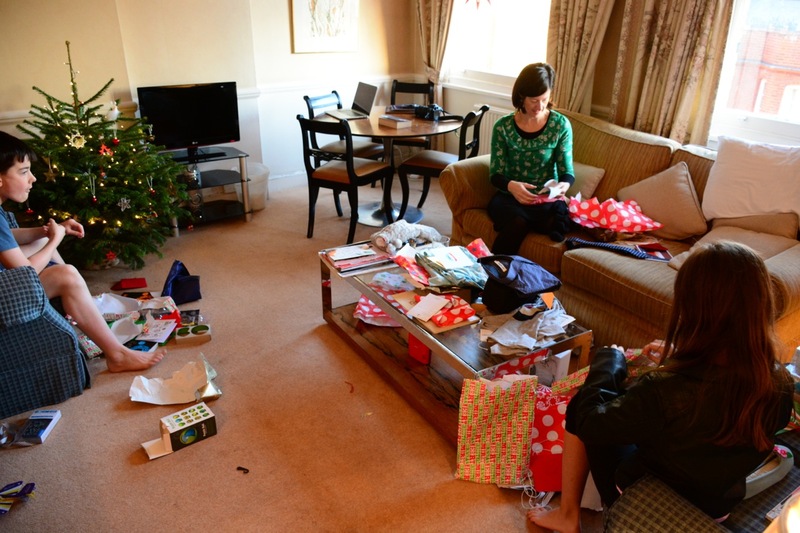 Strategically, we had booked lessons for 10am for the whole family. 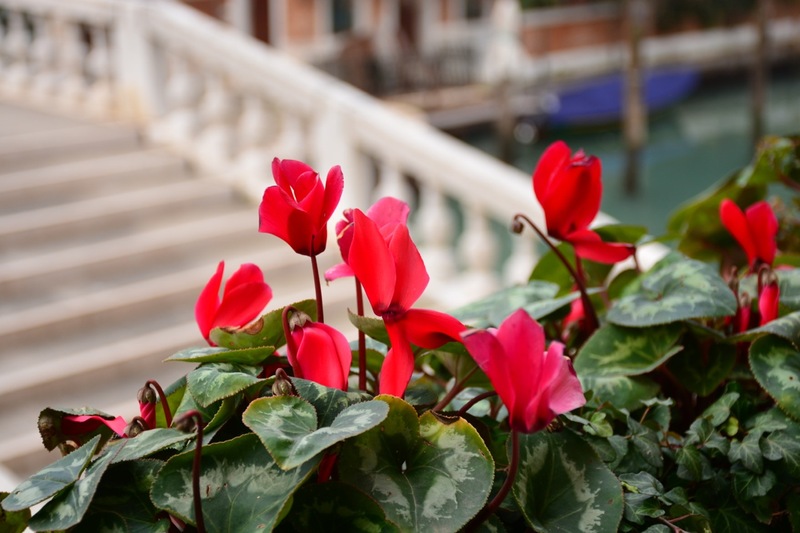 Time enough for us to shambollically get into our gear and stumble into the gondola for the ride to the top, and insufficient time beforehand to plunge down mountains inflicting damage due to lack of skill. 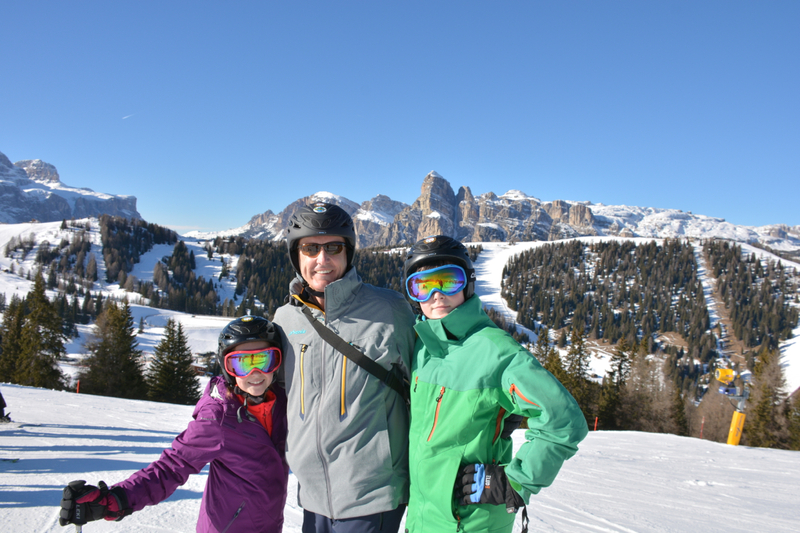 Will and Ele, were introduced the friendly Alex, a 30-something instructor born and bred in the mountains of Alta Badia. 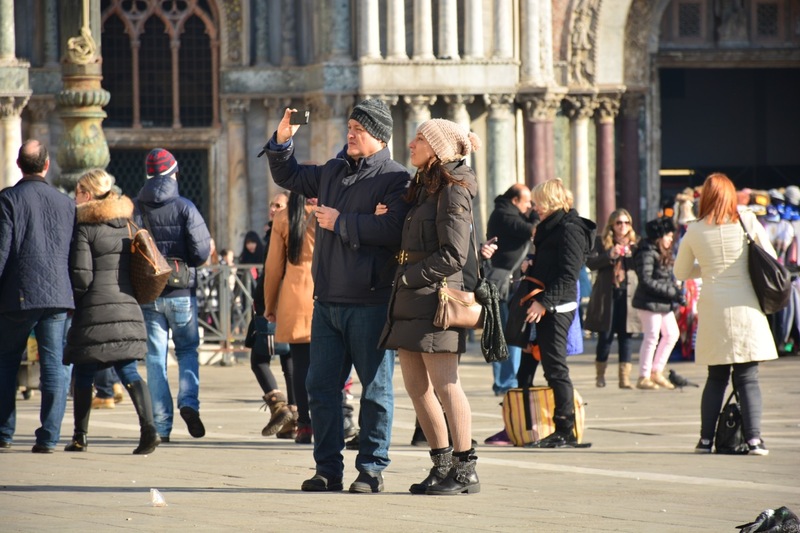 Fortunately, and with good humour, he established the fact that their total amount of skiing experience was the 50m from the gondola to the meeting point, and even then they had yet to clip into skis. Off they went with Alex to be instructed in the art of plunging down mountains whilst strapped onto sticks. 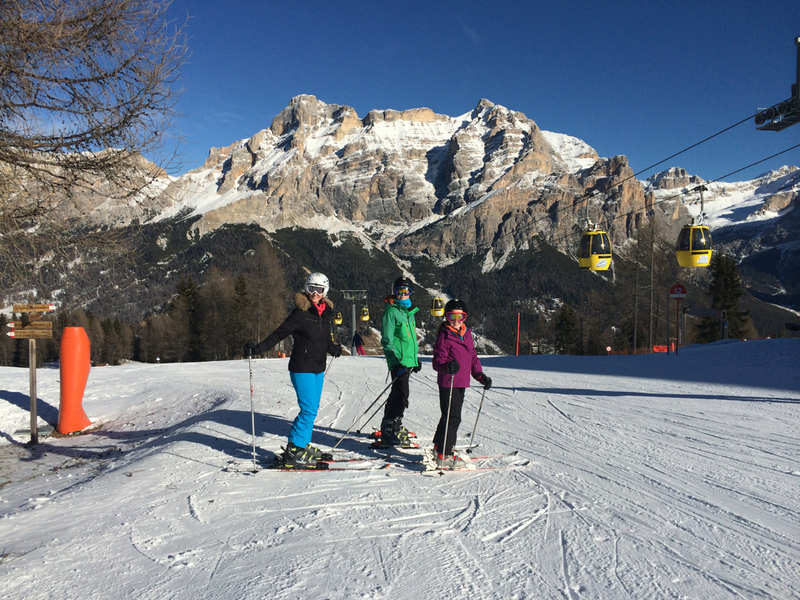 Two hours later, Alex returned to the meeting point with two confident, happy and uninjured kids who now could ski. 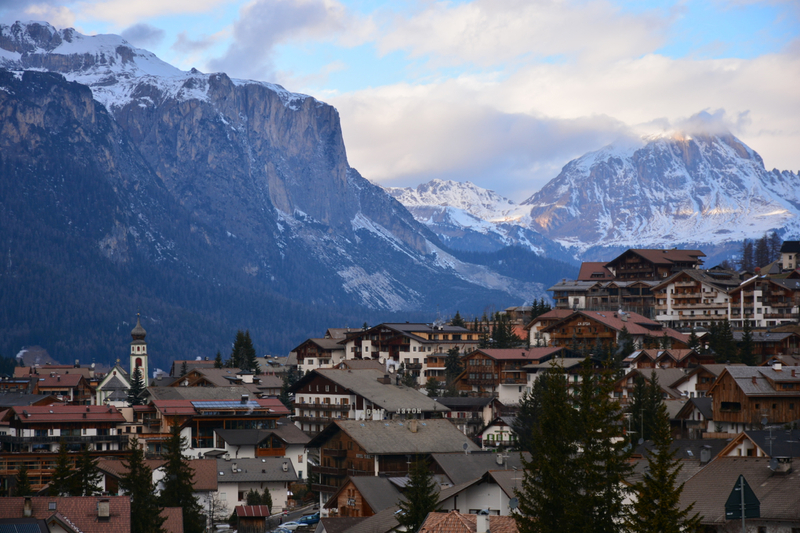 The day ended with a ski home, down the long run all the way back to the village. It was an absolute delight for Spike and Kate to be instructed by Guido, a bushy bearded, weather worn mountain man, 70 years of age. 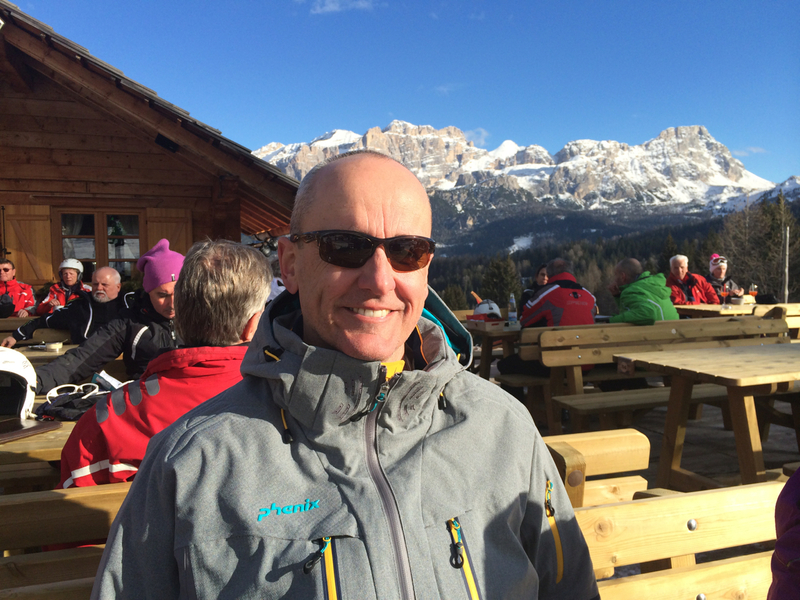 In his heavily accented English we learnt the Guido philosophy of skiing. 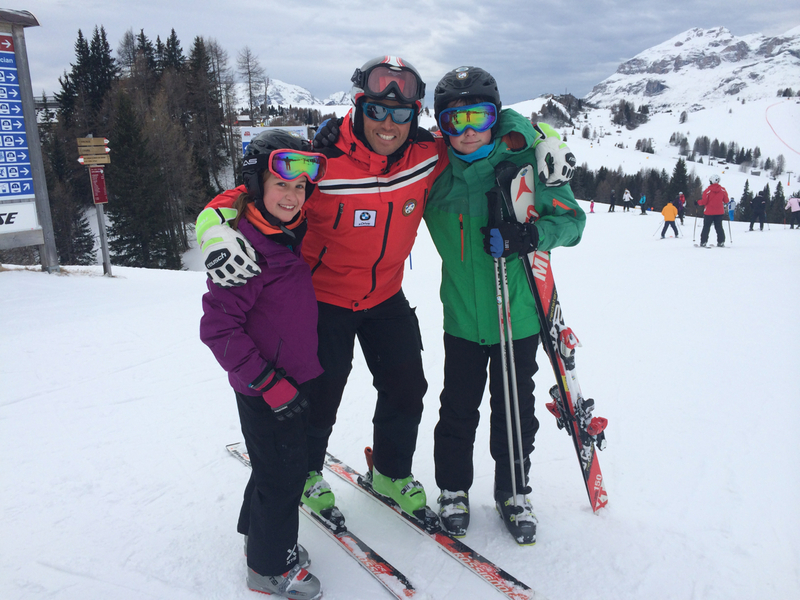 We discovered that he had taught Alex to ski and the manager of our hotel to ski. 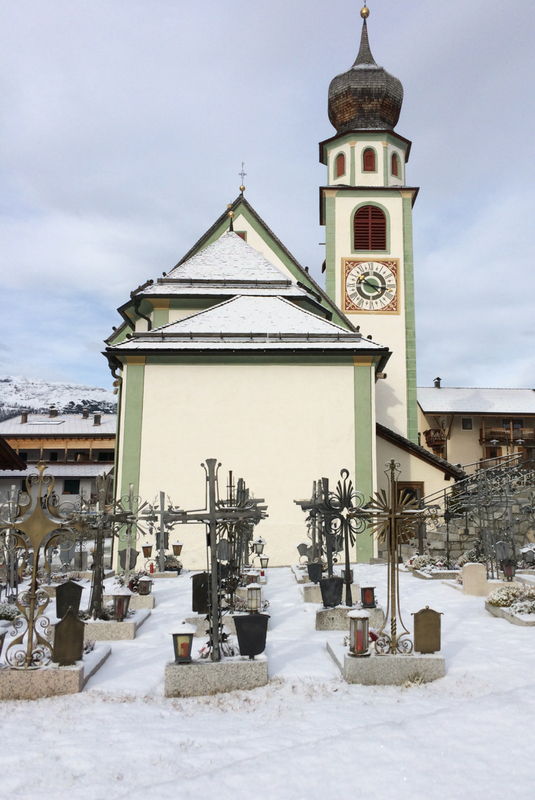 In fact it seemed he taught virtually the whole San Cassiano local population under the age of 50 (yes, he had been teaching skiing for 50yrs). It was like being taught by Yoda. 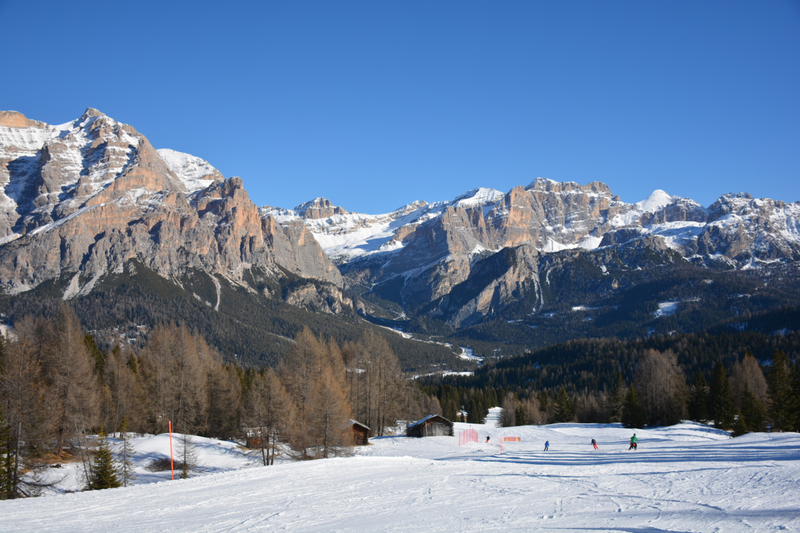 Every morning we would set off down the beautifully groomed slopes, following Guido as he expressed the joy of the first morning ski runs by yodelling all the way down to the bottom. 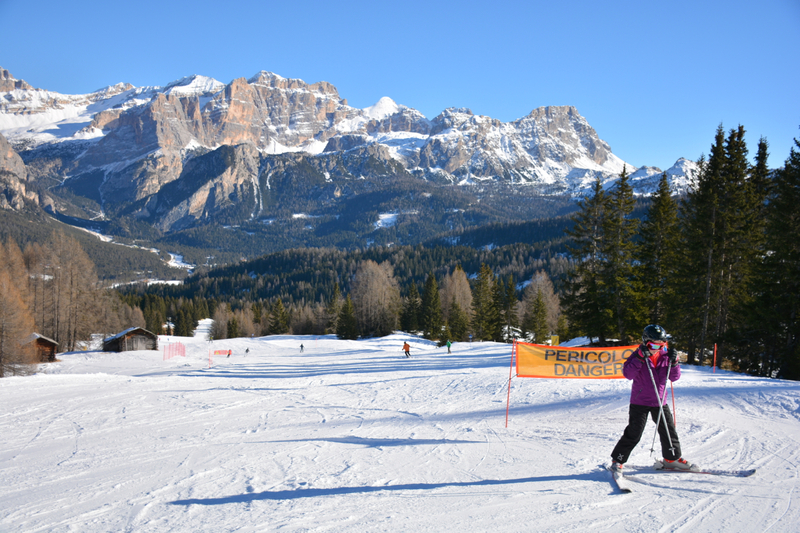 Over the course of the week, each morning Alex took Will & Ele off to another part of the Alta Badia ski area, returning with harder runs under their belt and demonstrating greater skill and confidence. It was also reported that Alex, too, yodelled his way to the bottom. Must be that mountain air. 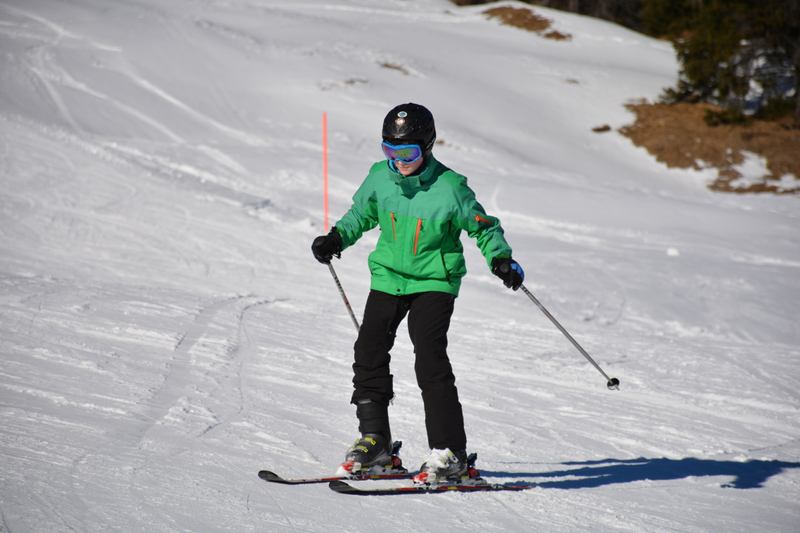 Every afternoon after lessons we skied as a family, doing more and more runs with each passing day. 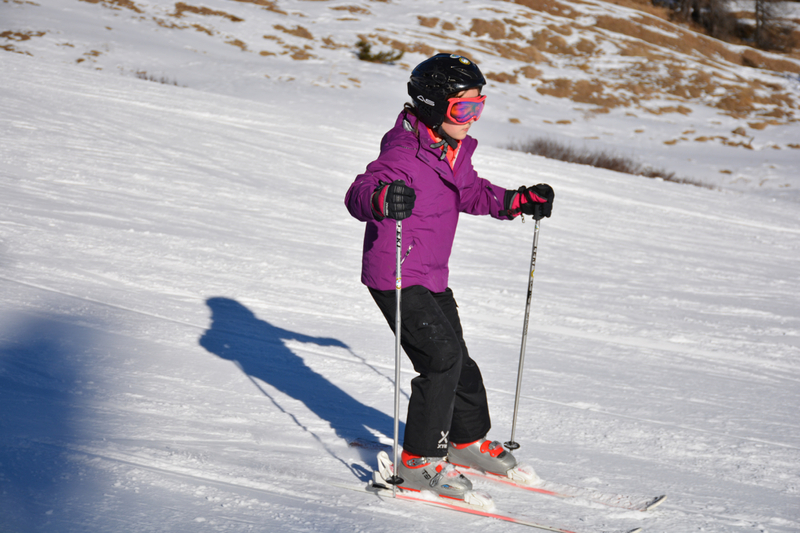 By the end of the week, our family skiing runs became a highlight as we swooshed downhill together. Day 2 and still alive! 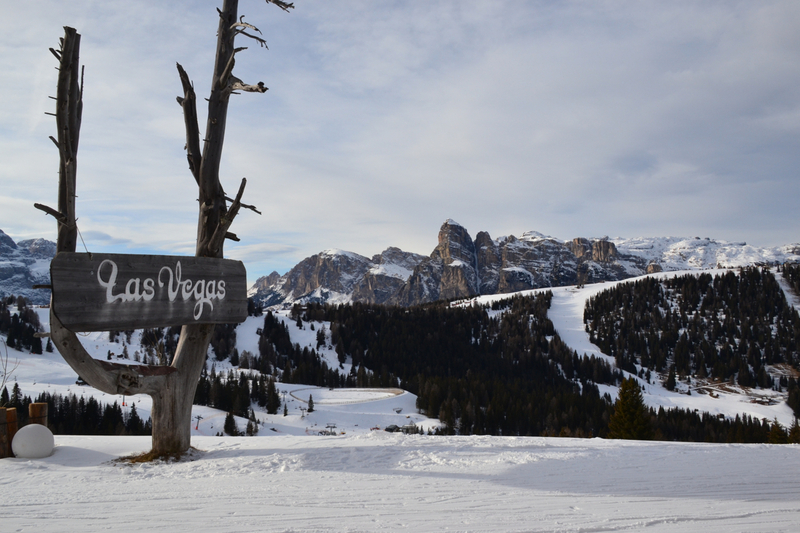 The Alta Badia Ski area, with Gruppo Sella mountains as backdrop. The Green Flash, photo bombing! 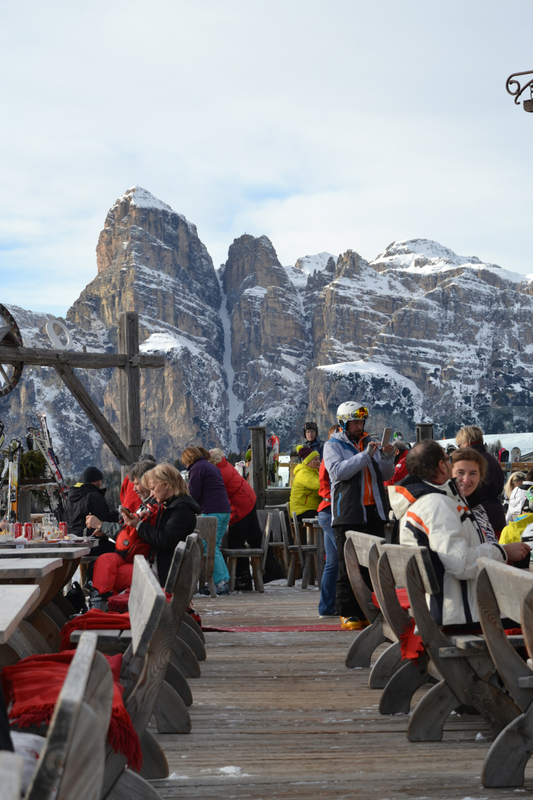 One of the joys of skiing from San Cassiano was stopping at the mountain huts and chalets for morning tea or lunch. 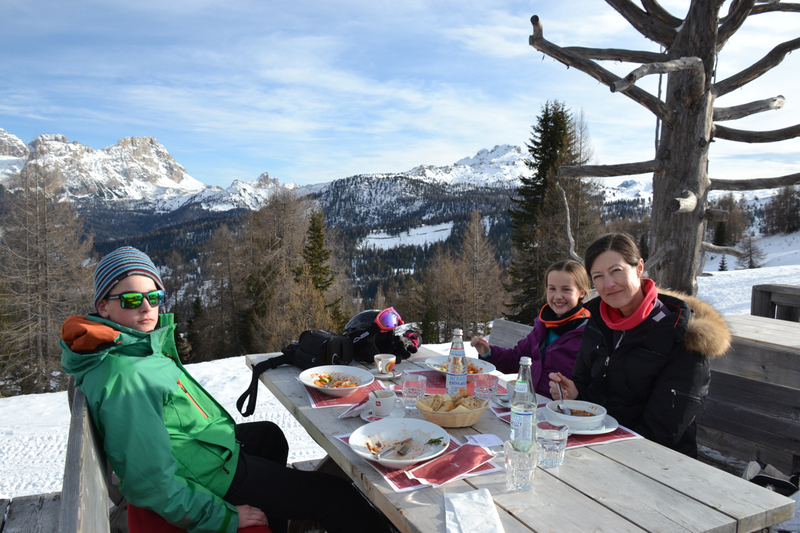 On a sunny day we loved skiing up to a hut, taking a table outside on the deck and enjoying a cracking cappucino or snack. 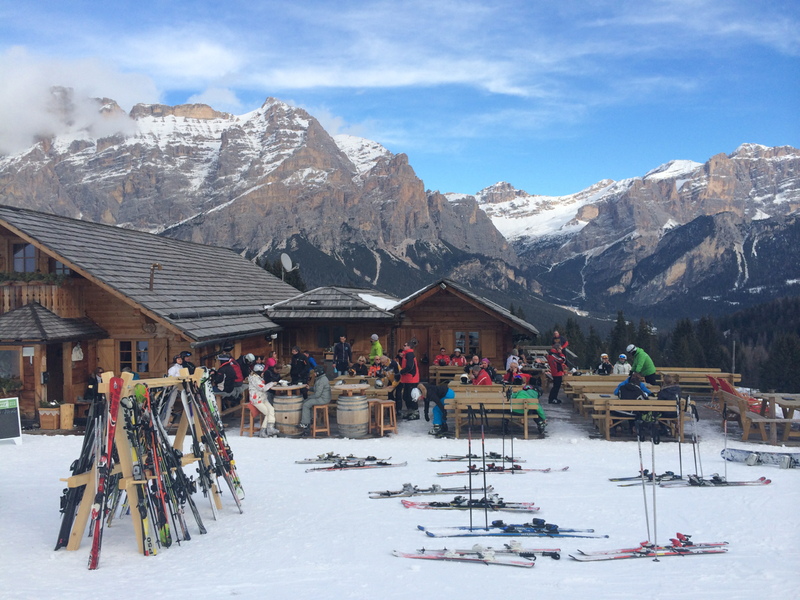 After some more skiing we stopped at another hut for late lunch of pasta or minestrone before tackling a few runs on the way back home. 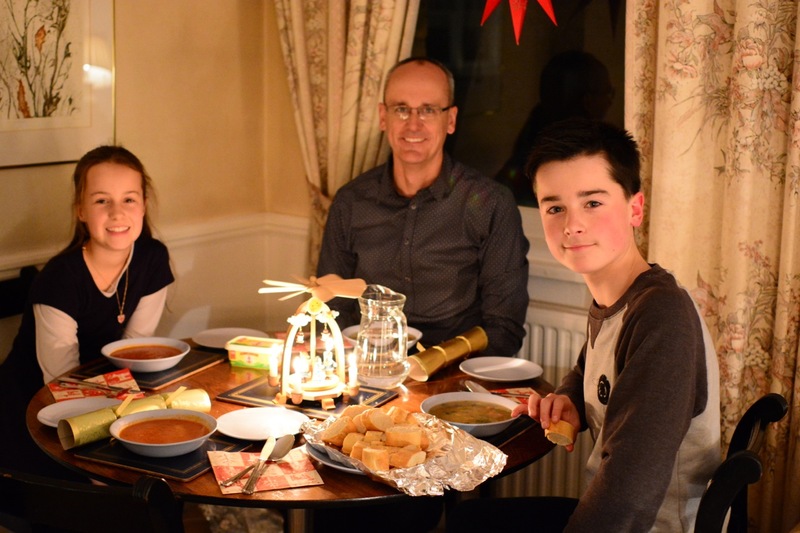 Staying at Hotel Störes, we settled down at our family table for the week. At breakfast and dinner, the friendly Ingo served us, teaching us various Italian phrases and helping us to decipher the local Ladin cuisine. Whether it was a Deer Goulash or Apple Schmarren, we ate in true mountain style, although a few complaints about the extent of zucchini and saukraut were registered. One evening, outside on the terrace, the hotel brewed up a few pots of mulled wine and had a local musician playing some tunes on the accordian. The lyrics went a bit over the head, however we did get into the groove of the music by joining in a Ladin style conga line. I think it was the below freezing temperatures and the falling snow that encouraged one to keep moving. 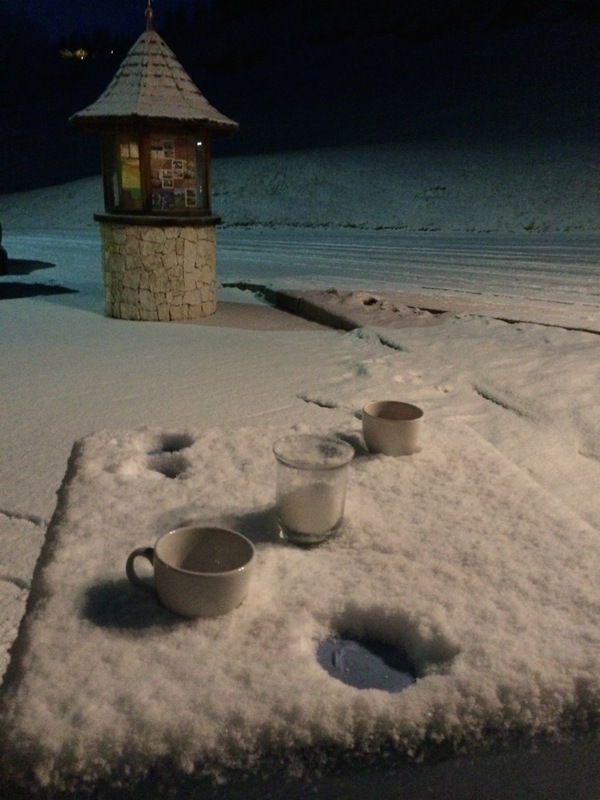 Mulled wine and mountain music, complete with snowfall! A unique experience for me was the morning Guido took me down the local black run. 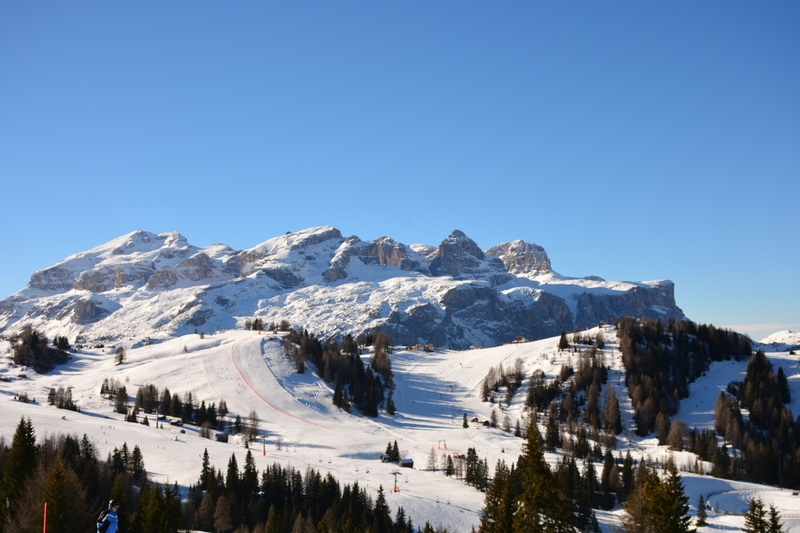 Used each year for a World Cup Giant Slalom race, the Gran Risa run into La Villa plunges near vertically off the side of the mountain, descending for an eternity. Taking me by surprise, Guido led me off a chairlift and before I worked out where I was going, he said, “follow me” and plunged over the side of the “cliff”. I followed, hanging on for what its worth whilst Guido yodelled and weaved effortlessly down the mountain. Fortunately I lived to tell the tale. 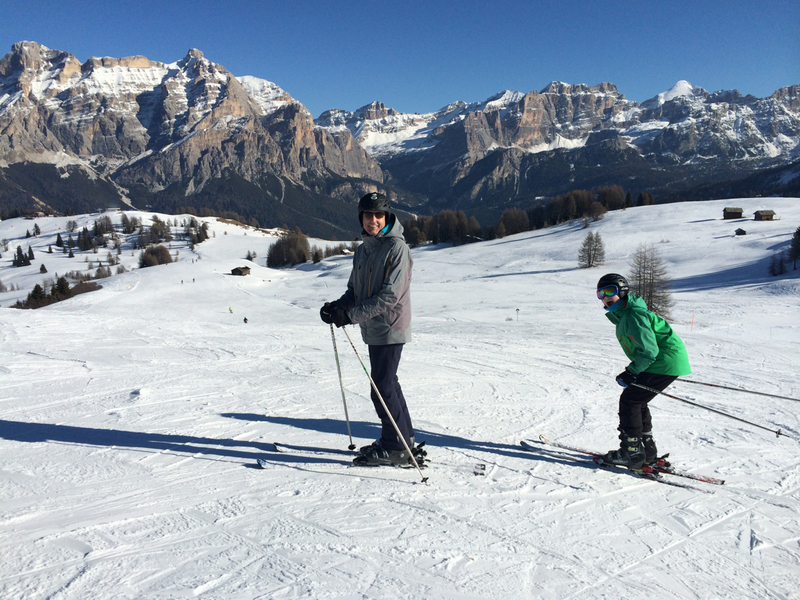 San Cassiano and skiing in the Dolomites was a highlight for all 4wheatleys. 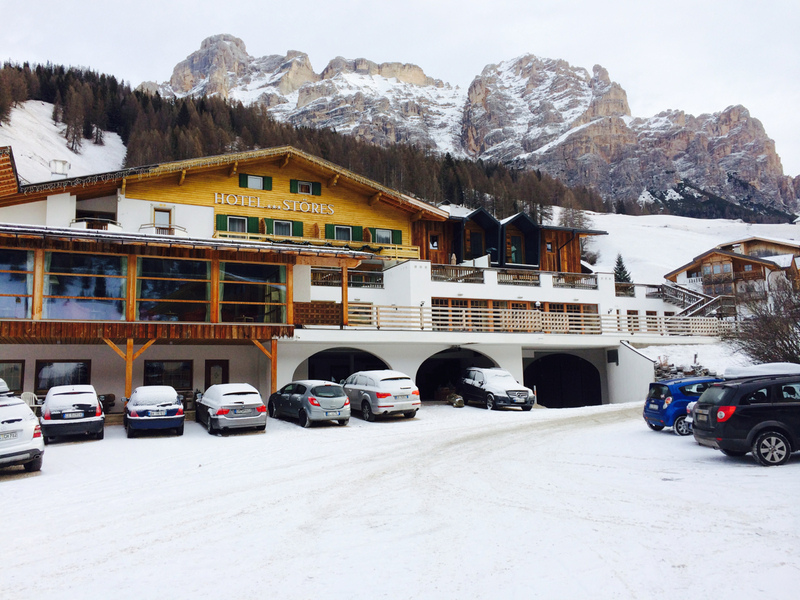 The sheer beauty of the mountains, the friendliness of the people, the relaxed vibe of the Alta Badia ski area and the enjoyment of skiing, meant that we all left wanting more. 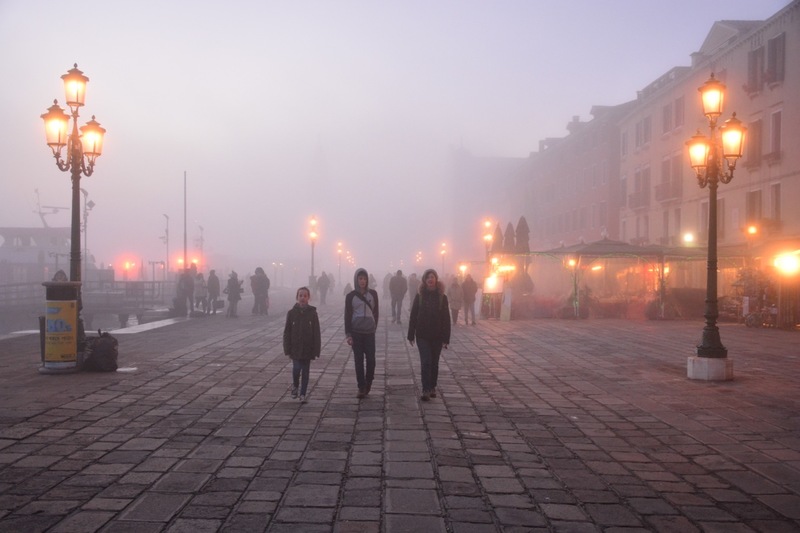 A big snow fall arrived as we started our trip back to Venice. While we journeyed through the white out, back over mountain passes, we plotted how to make a return trip. 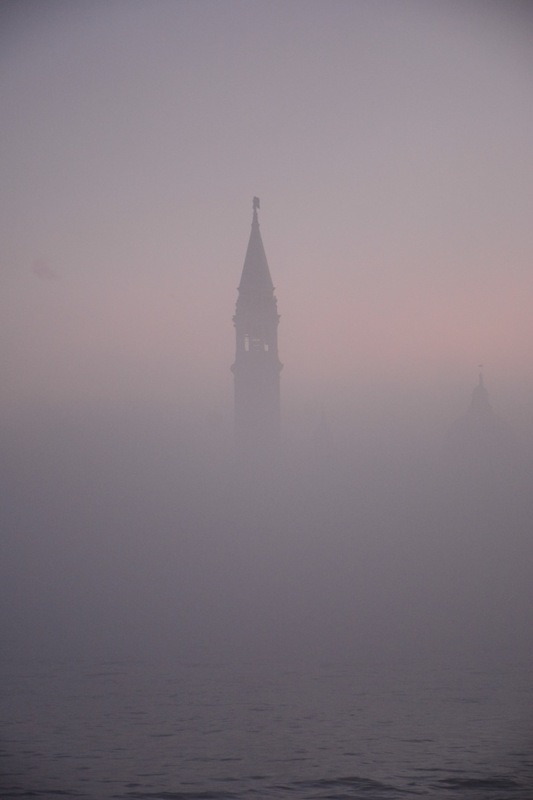 A snowy journey back to Venice. Smiling because there is finally decent coffee! Barcelona. What does it mean to you? Coming off the train we all had mixed ideas. 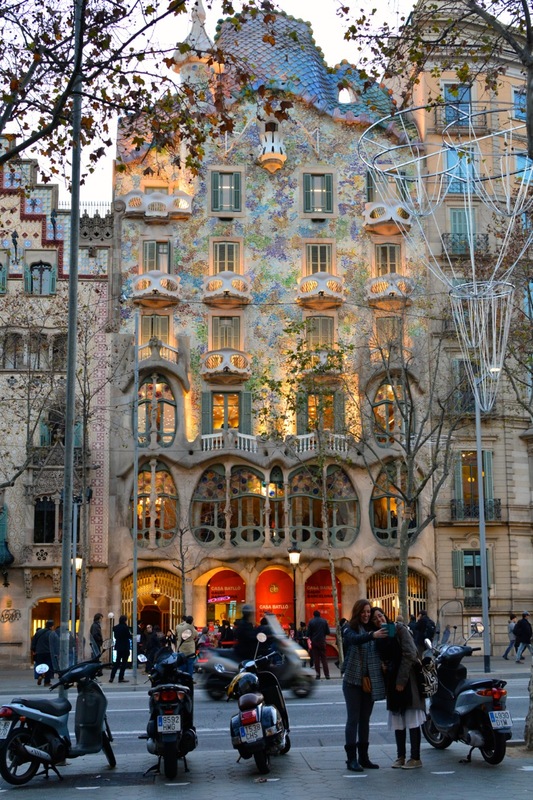 Mum thought it might be three days of exploring beautiful Antoni Gaudi architecture and I was ready for three whole days of football, football and football. But as we walked out of the station one thing shone (literally), the weather! The sun was shining and no rain clouds could be seen in the sky. This was looking like a good three days for the 4wheatleys. We had to wait a bit before we checked in and in that time we thankfully made a compromise of both Gaudi and football. 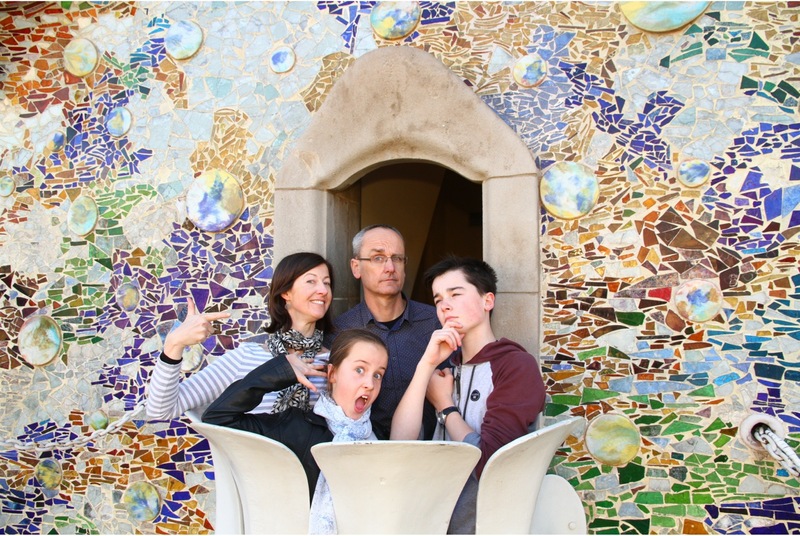 During the time we were waiting, we decided to tick Gaudi’s Casa Batllo (which was just across the road) off our list. Now if you’re like me you know that all old buildings and art are boring right? Wrong! 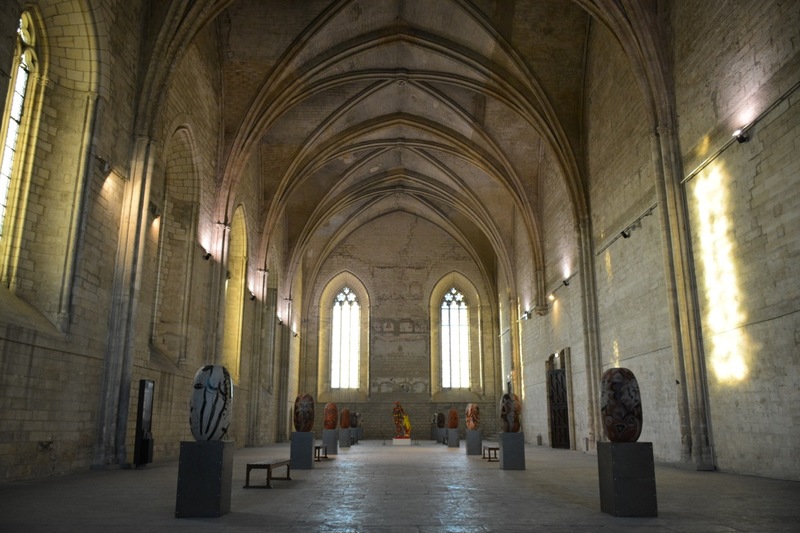 Only MOST old buildings and art are boring. 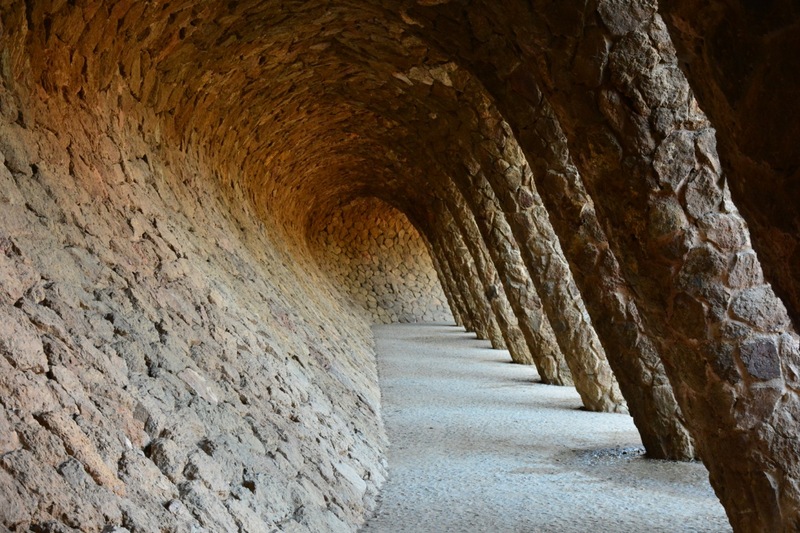 What makes Gaudi’s work special is that his inspiration is nature which makes his architecture different, more interesting and full of of natural light. Everyone thoroughly enjoyed the experience. 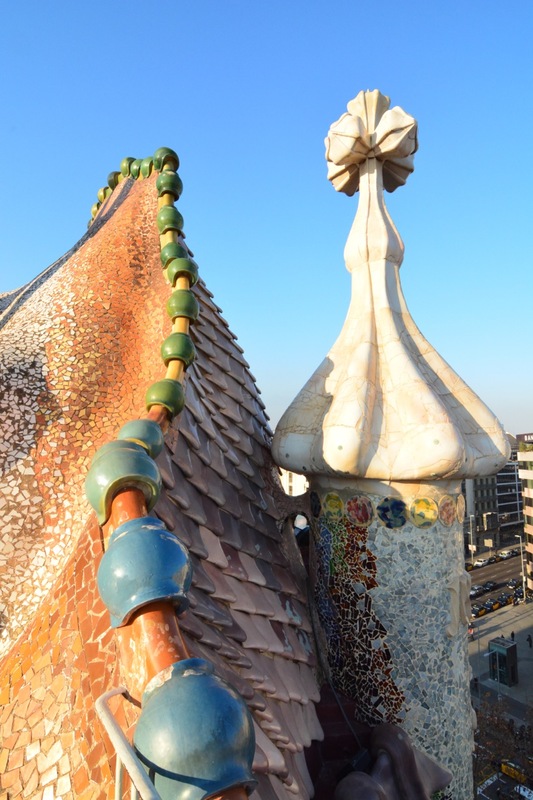 The dragon back roof of Casa Batllo. 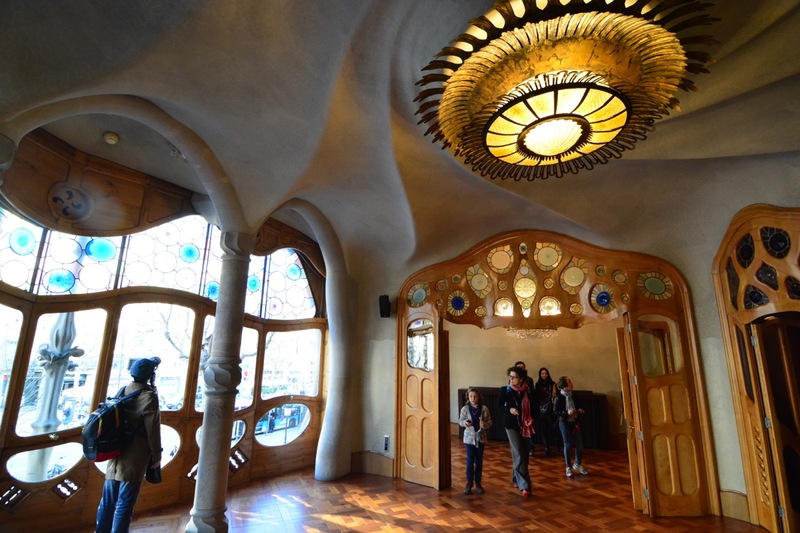 The light-well of Casa Batllo. 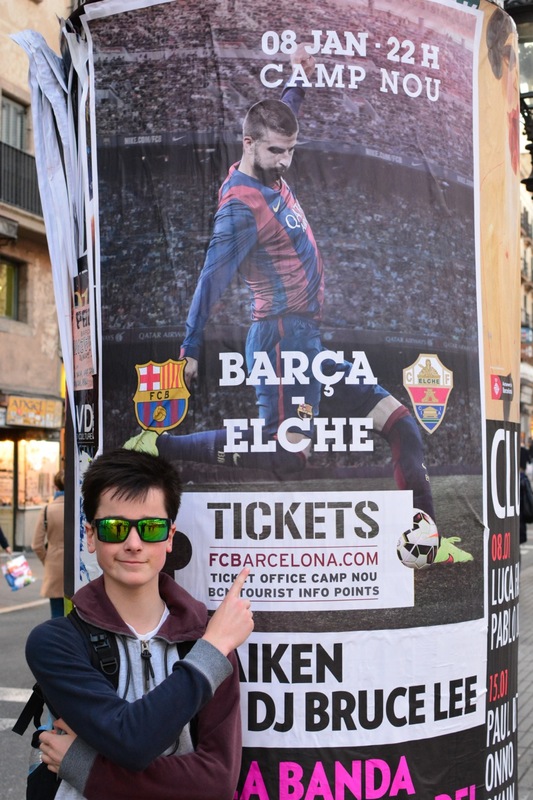 We then settled down into our apartment and Dad managed to get tickets to Barcelona vs Elche the next night. We were so excited! 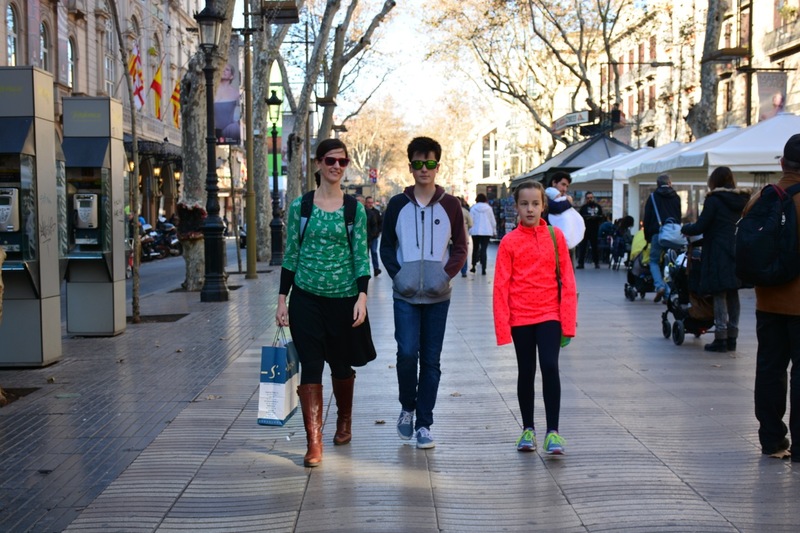 The next morning, Dad and I went for a run down the famous Ramblas. At the end there was a beautiful harbour sparkling in the sunlight. 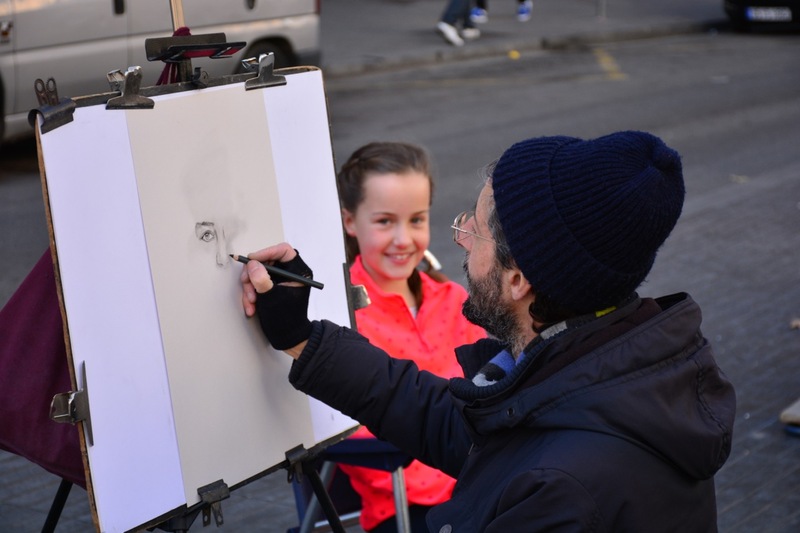 Later that day we rambled down the Ramblas as a family and Ele got her face drawn. 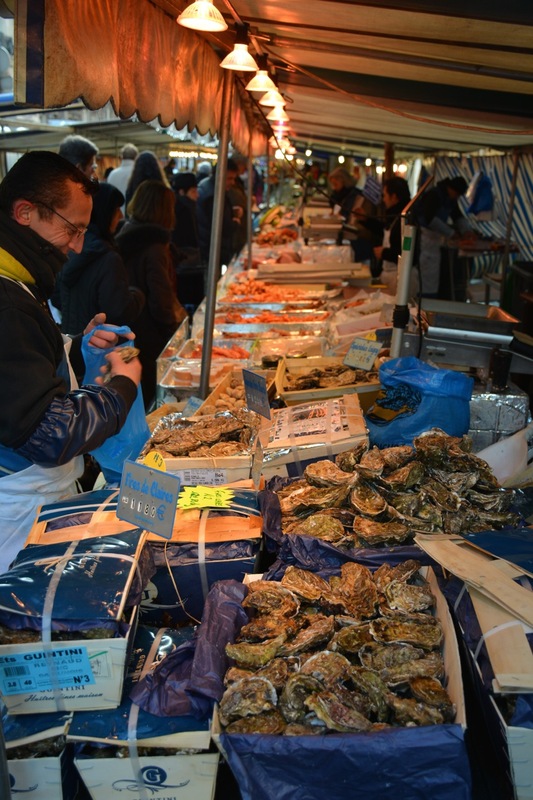 There was a huge market which we decided to explore. All kinds of food was sold there including chocolates, vegetables, seafood (dead and alive) and more. We went home with some meat filled pastries for dinner. That night was match night. 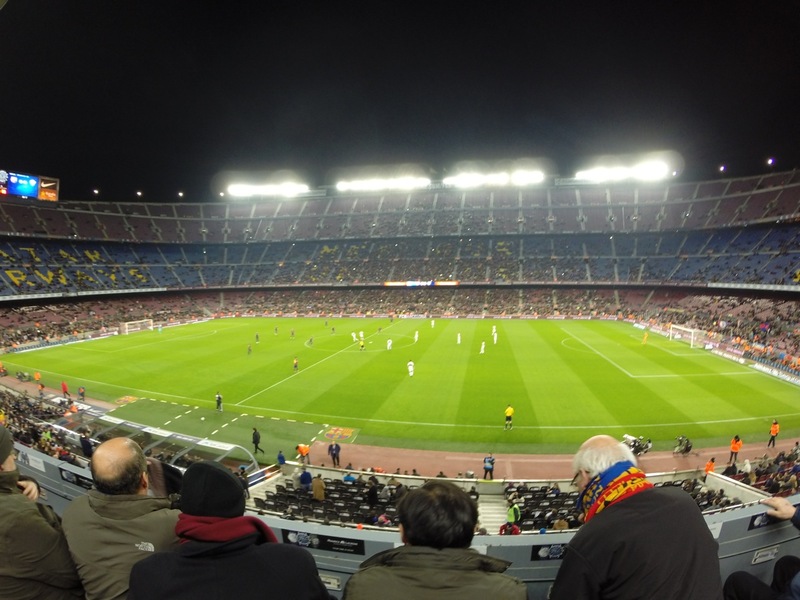 I was eagerly anticipating my first ever Barcelona football match. Kick off was 10pm!! First stop; merchandise store. This was no ordinary store, it was the one and only FCB Official MEGASTORE!!! ( dramatic, huh?) I was now fully equipped with my home jersey and official home scarf, and ready to enter the stadium. The atmosphere was amazing. 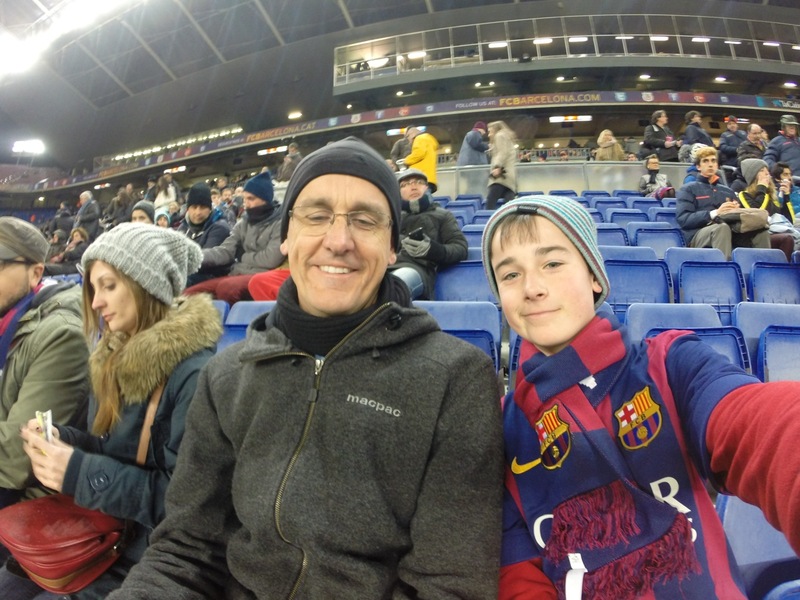 The Barça song was played over the speaker while Dad and I effortlessly hummed and somethinged along to the tune. I was super excited when I first saw Messi, Neymar and Suarez in real life! In the end the score was Barça 5-0 Elche the first goal being a defense-dissecting set-up by Suarez and Messi and a cracking finish from Neymar. It was an unforgettable experience. Camp Nou, the third biggest football stadium in the world. Day 3 was Gaudi day. One thing I must mention is that when your dad wakes you up on holidays, it’s not pretty. After a lot of yawning and tired-teenager noises I was ready to start Gaudi Day. 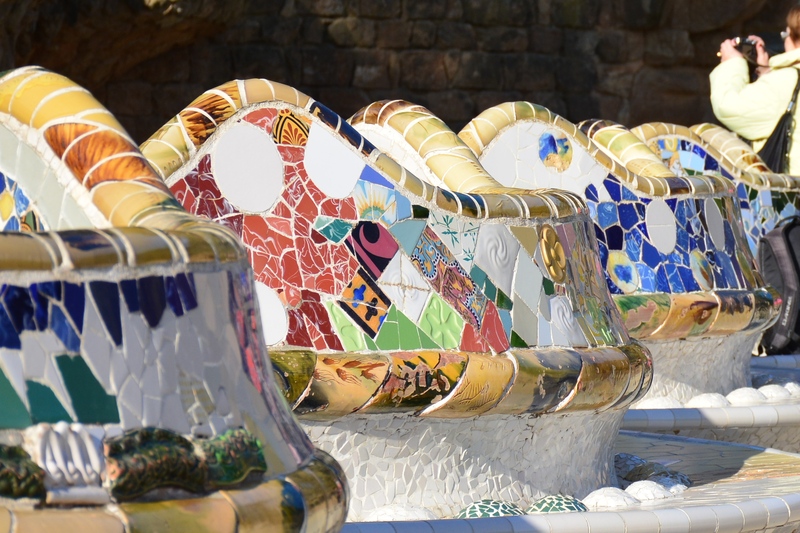 In the morning we visited Park Guell, a beautiful park, designed and built by Gaudi. 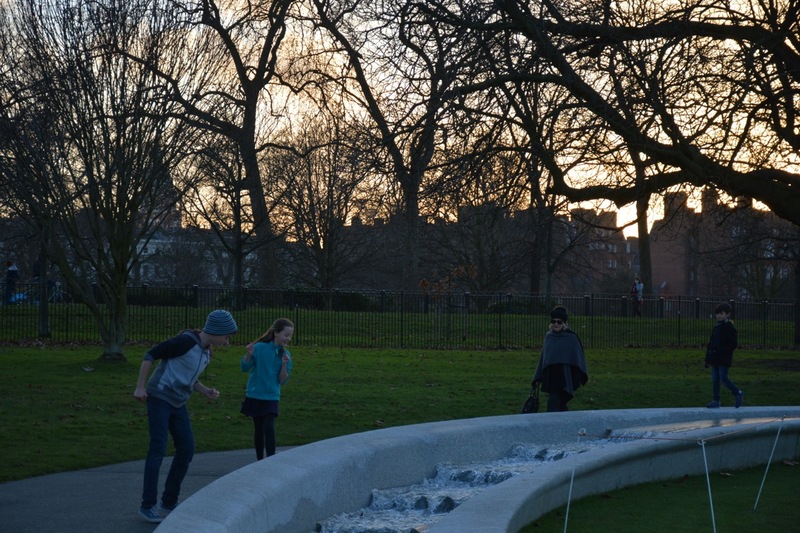 The park had all natural beauty and the structures echoed the natural environment. 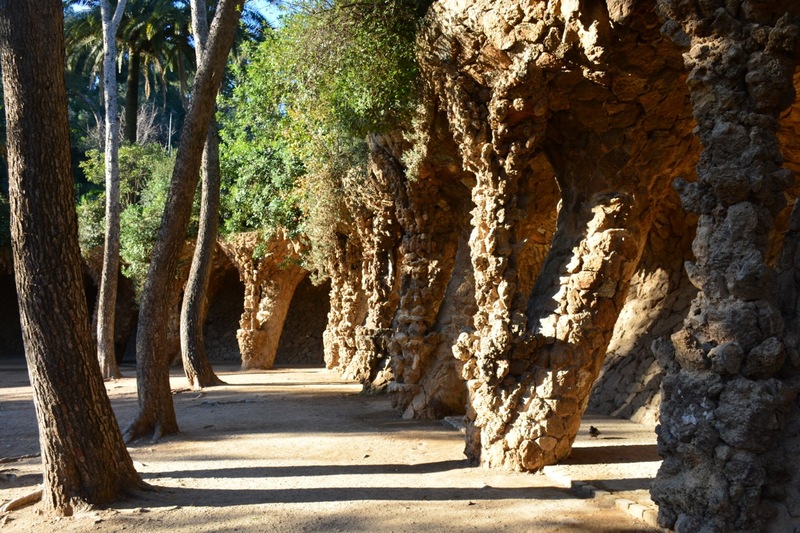 The leaning path in Park Guell. Nature and Man (made) together. Not your ordinary park bench eh? 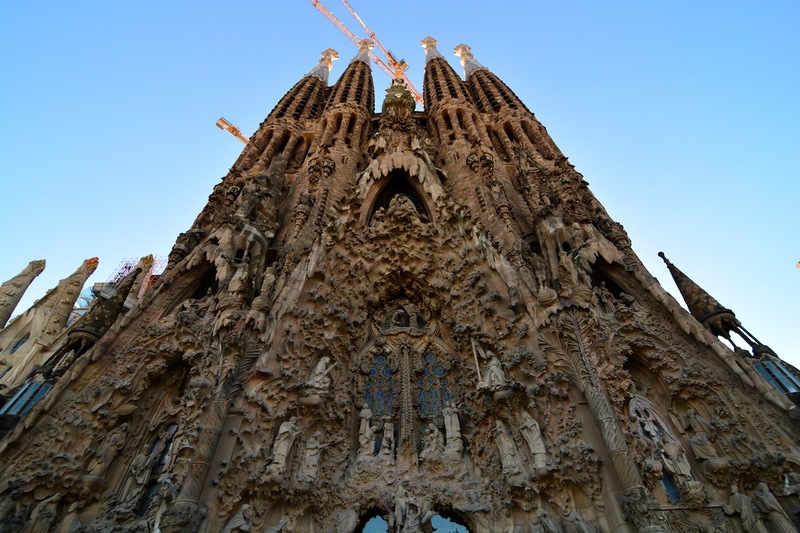 In the afternoon we traveled to the most famous of Gaudi’s works, the massive cathedral, the Segrada Familia. Sounds familia? It isn’t finished! 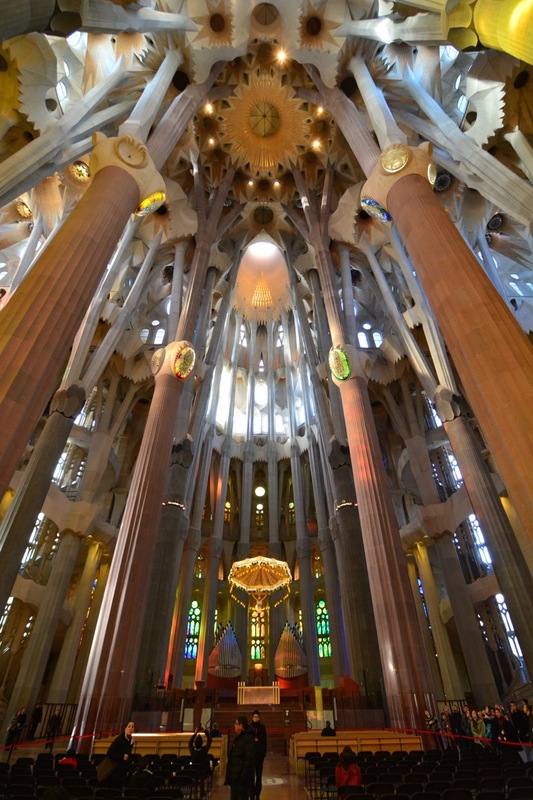 Many designers have taken up the task to imitate Gaudi in the design so the church looks like a mish-mash of different styles. 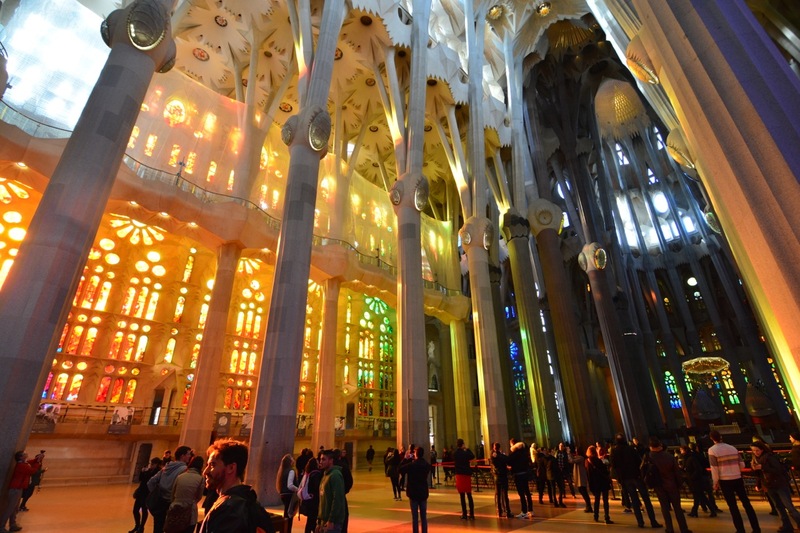 The Segrada Familia is all about light. Gaudi has perfectly tinkered with the light levels and colours of the stained glass windows so the church looks its best. 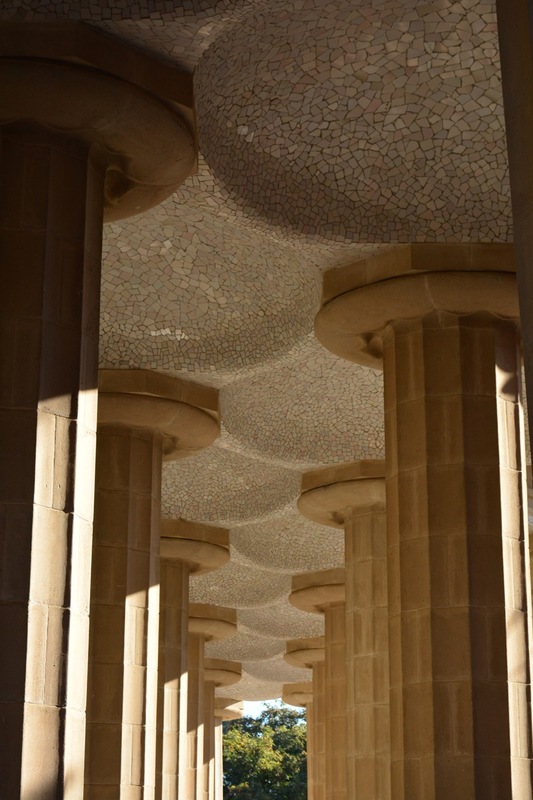 The pillars inside the building are designed to look like trees and the roof is decorated like palm fronds. 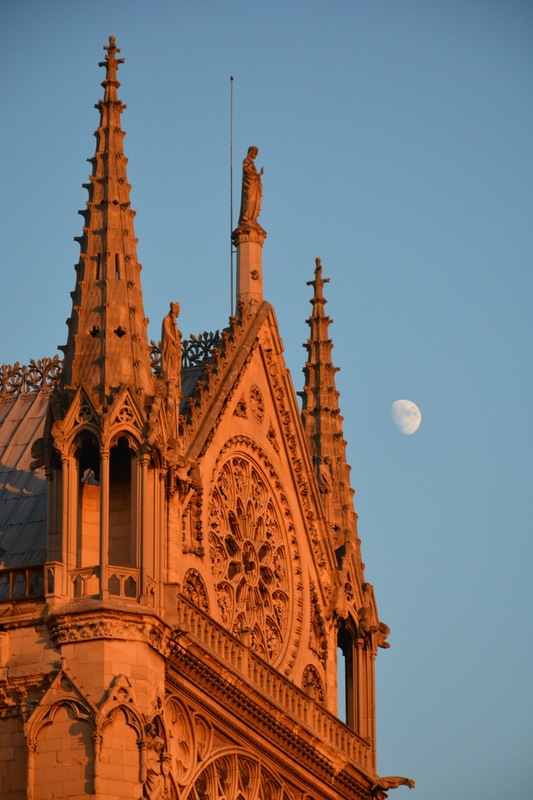 The Massive cathedral has been under construction since 1882! 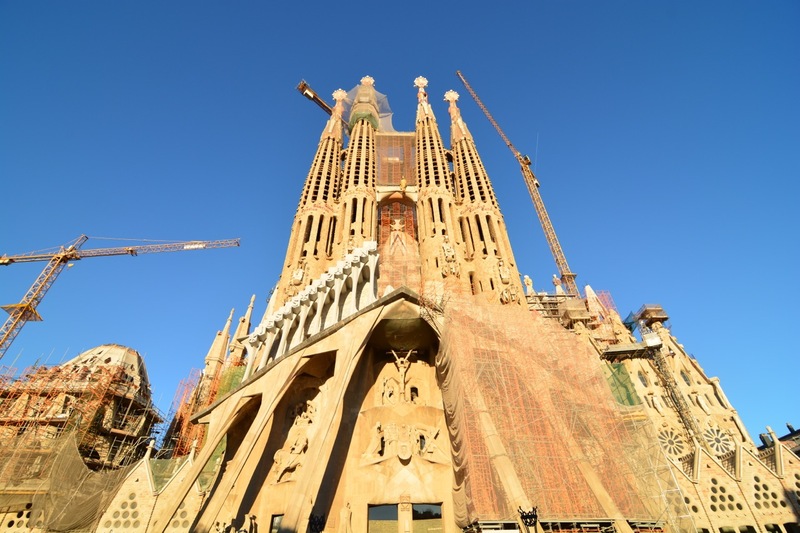 The Segrada Familia under construction. 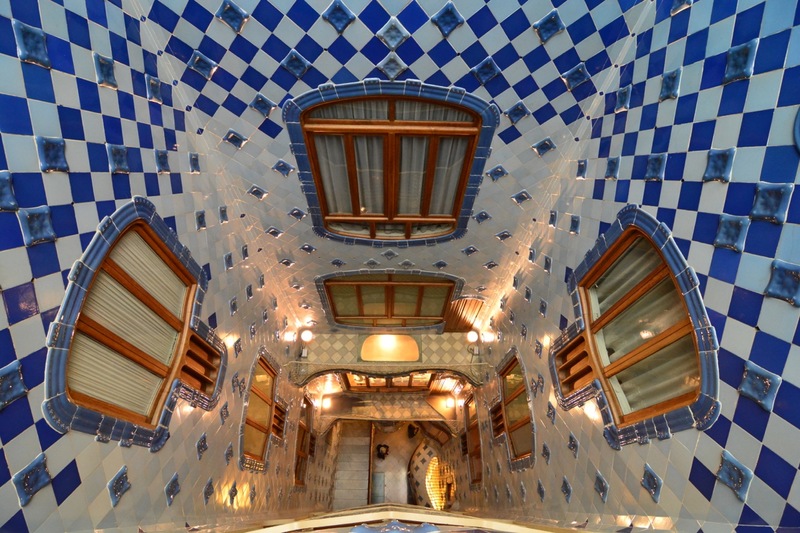 The breathtaking interior of The Segrada Famila. The light through the windows. Saturday. Our last day in Barcelona 😥 . 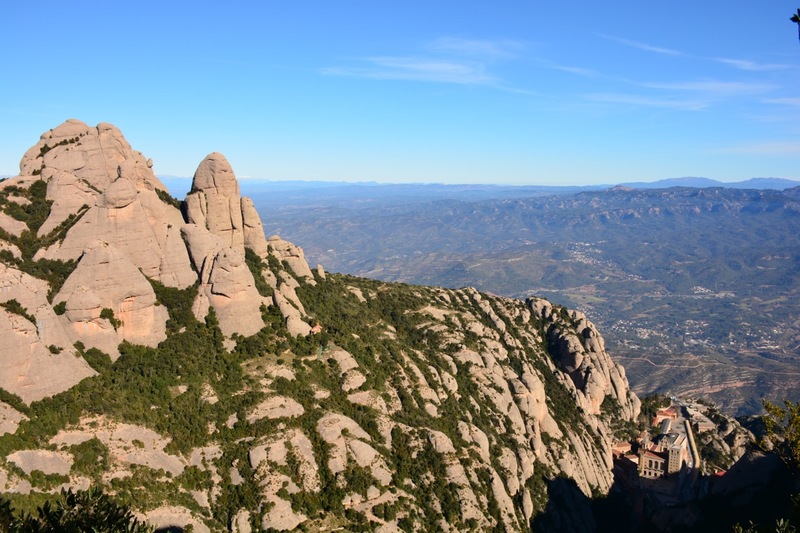 On that day we decided to climb the mountain Montserrat. To get there we had to take an hour train trip. Some nuns on the train went to the toilet ( which was right next to us) and I think they might have had too much of Sister Catherine’s Curry Surprise… To reach the town from the ground we took a cable car that was really steep up to the town on the middle edge of the mountain. 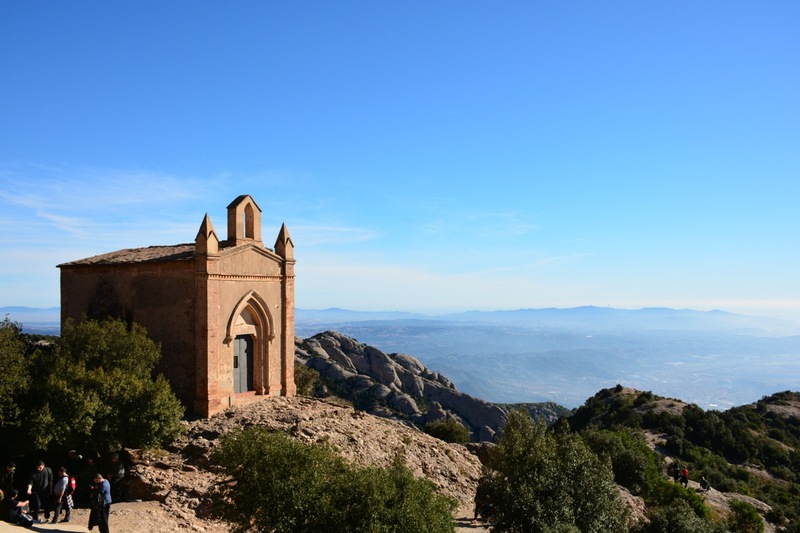 This mountain had a whole monastery for nuns on it and lots of little chapels dotted on the steep rock faces. We scoffed down some lunch and caught the funicular railway to start off on our hike up the mountain. The scenery was stunning. 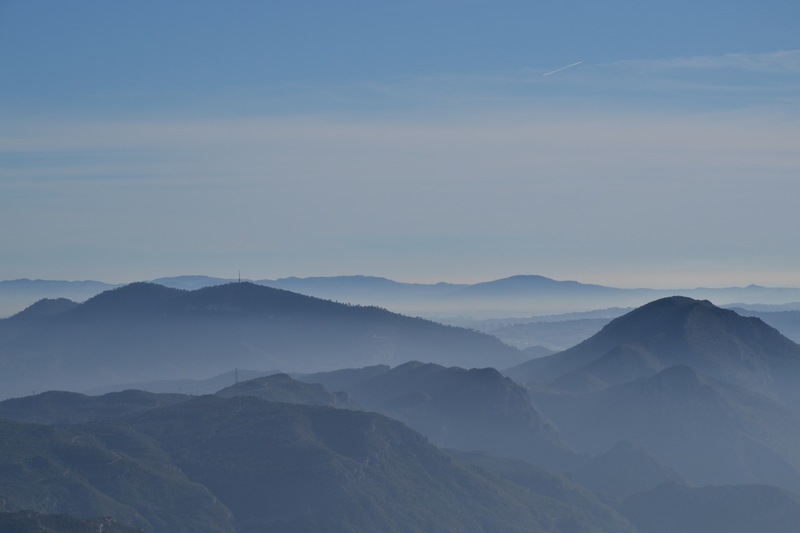 Mountains glowed a hazy blue in the distance and valleys rolled into picturesque villages and towns. There were lots of steep stairs, and challenging climbs that I really enjoyed. We loved the mountain, the weather and the hike. It was a great day. 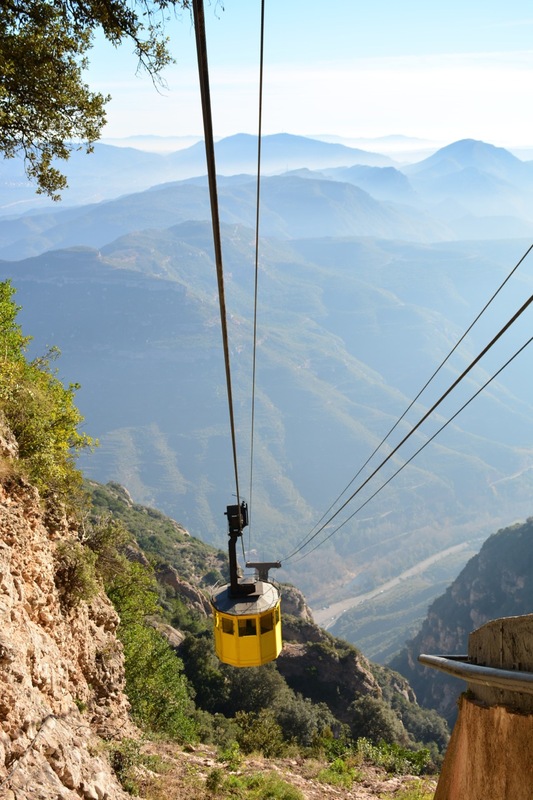 The cable car up to the mountain. I must say, whoever took that shot is probably a great guy. Gee, who knew nuns were so into climbing!? We bade a sad farewell to the sunny city of Barcelona. It was one of our favourites so far and we were sorry to say goodbye. 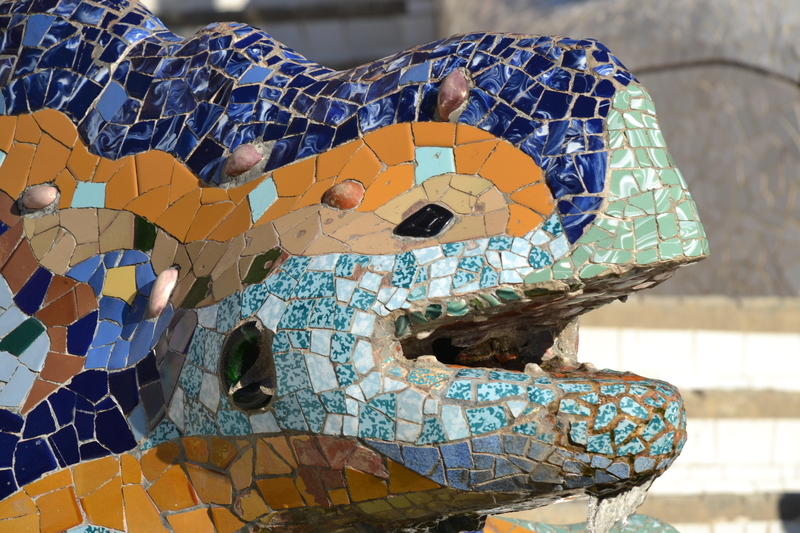 The dribbling lizard statue in Park Guell. The Segrada Familia Nativity Facade. 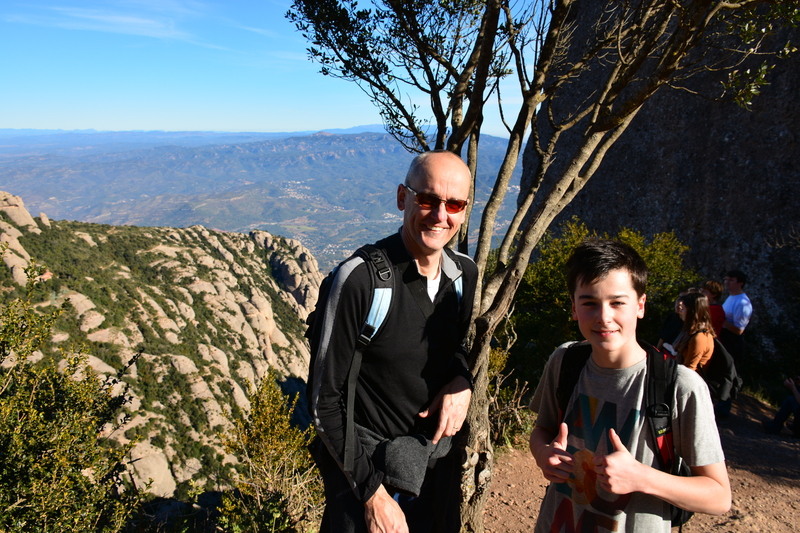 Two hikers that conquered Montserrat. The Monastery on the mountain. Home of Sister Catherine’s infamous Curry Surprise. 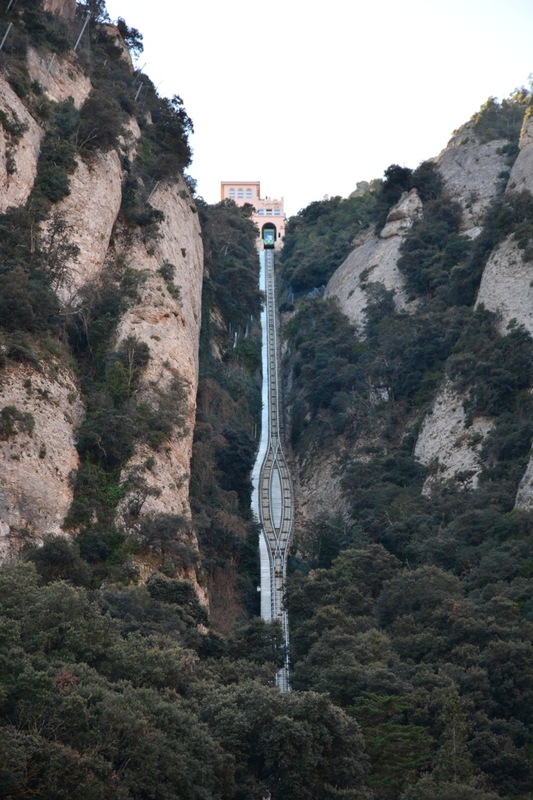 The funicular railway of Montserrat. Pick up your game Scenic World! For the first time in several weeks, the weather forecast for the next section of the trip promised a positive (read: warmer / sunnier) change. 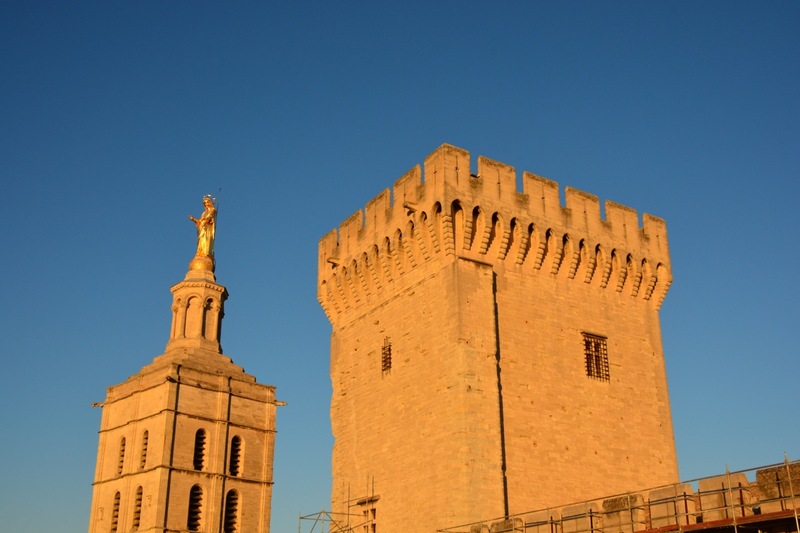 Arrival in Avignon was the signal for Will to strip off down to his T-Shirt and stay in it, no matter how chilly it threatened to become. Happily it was warmer. From the start we enjoyed the sunbathed balcony. The bizarre collection of cats in the surrounding backyards onto which we looked, provided a bonus (and continuing) saga of stealth and counter attack that the kids embellished with enjoyment over the 3 days. 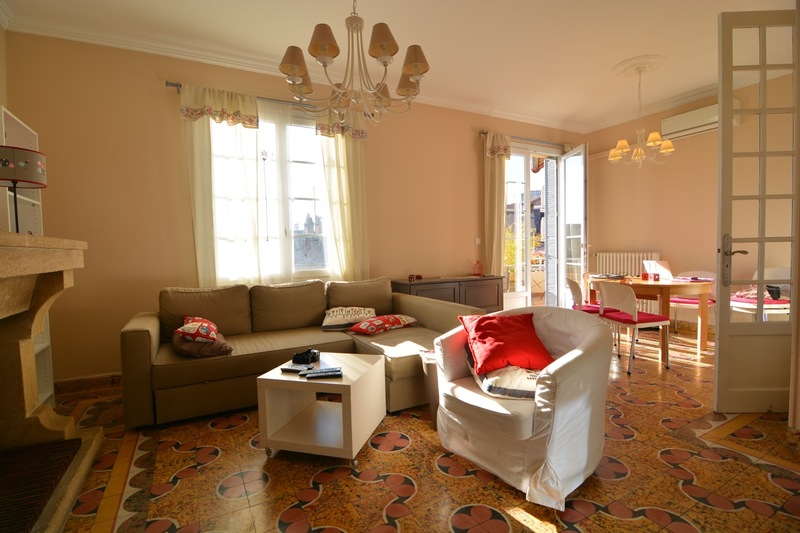 Our sun filled apartment – with original mosaics on the floor, and a door to the balcony. 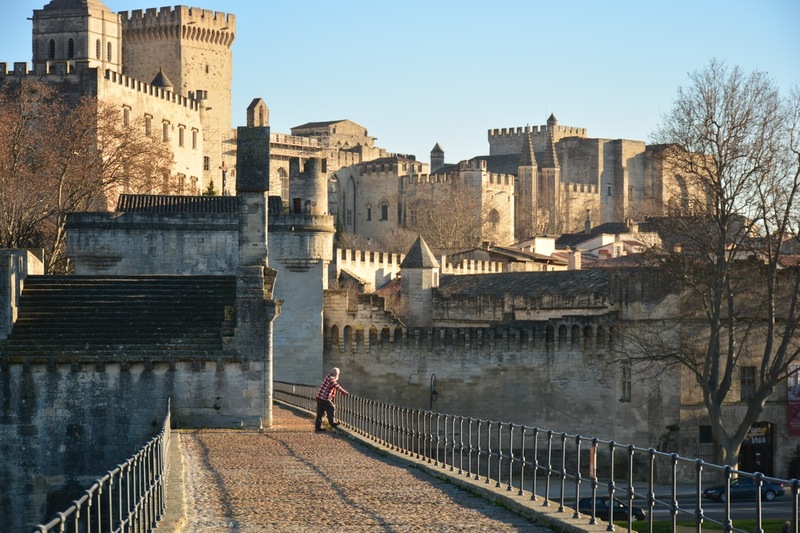 Avignon is a walled city of some history, much of it dating back to the Romans and the time when it was the seat of the Papacy in the 14th Century. Thus there is an old city (within the walls) and a new city (without the walls) and plenty of things to interest the 4wheatleys in the nearby surrounds. From across the water at Villeneuve – looking towards the old city. 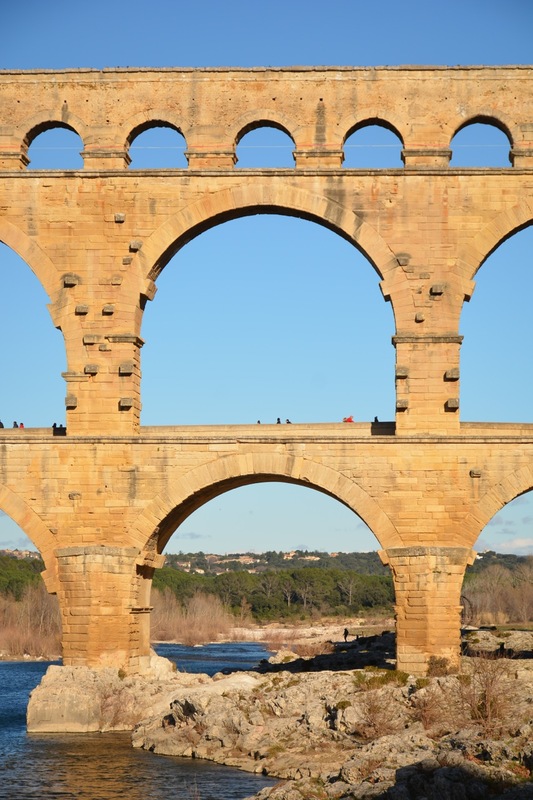 All it took for this Wheatley to be satisfied, however, was a trip to the Pont Du Gard. After so many years teaching Year 6 about design and construction of bridges, I was thrilled to tick another off my list. 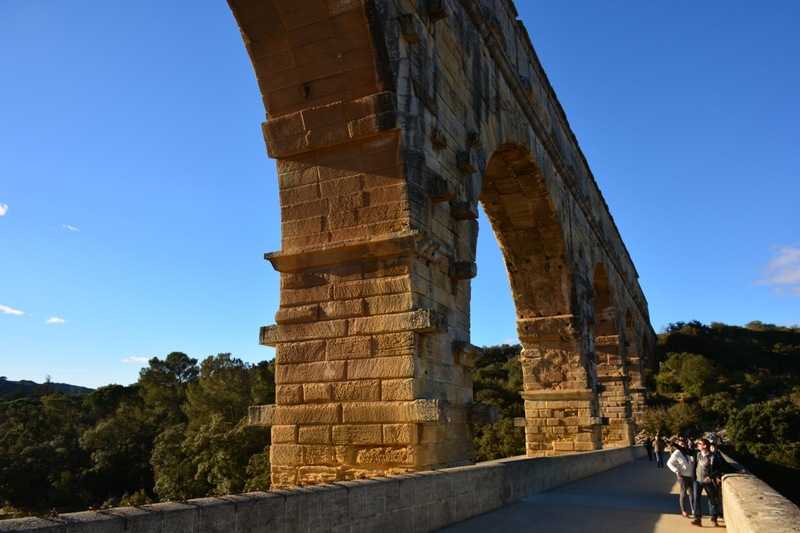 The Roman Aqueduct across the Gardon River was looking its luminous best in the afternoon sunshine. 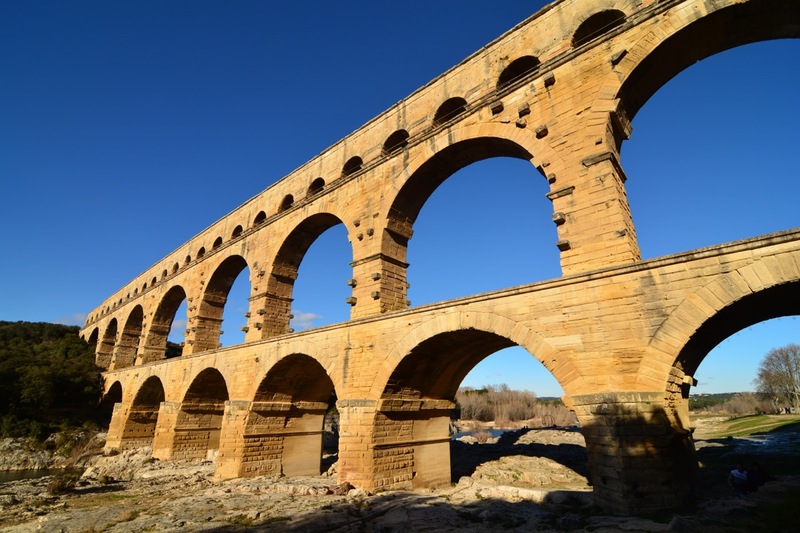 It was built to carry water from a spring in Uzes to Nimes and was one of the few sections that was above ground. 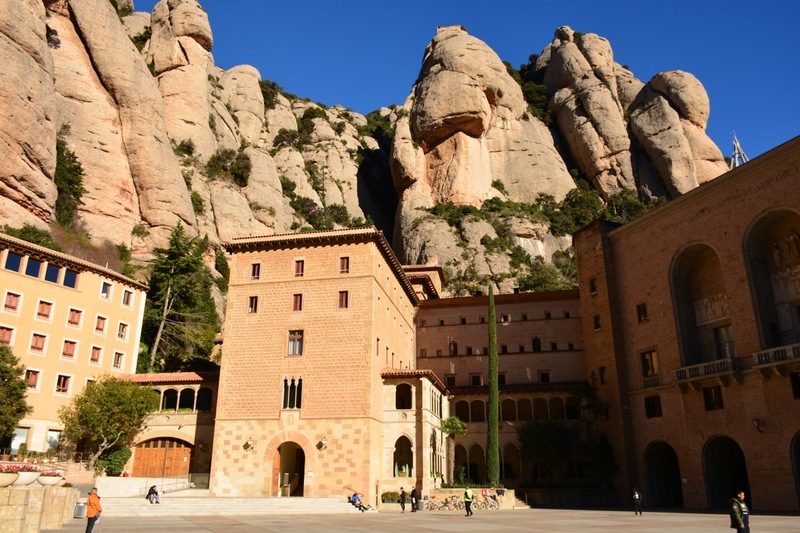 Constructed in the first Century AD, it is incredible to think that it survives, and as such, it was included on the UNESCO World Heritage list in 1985. I loved it. We walked along a track to obtain more panoramic views and the very act of bushwalking where there were some evergreen trees reminded everyone of home. Just getting carried away with photos now! 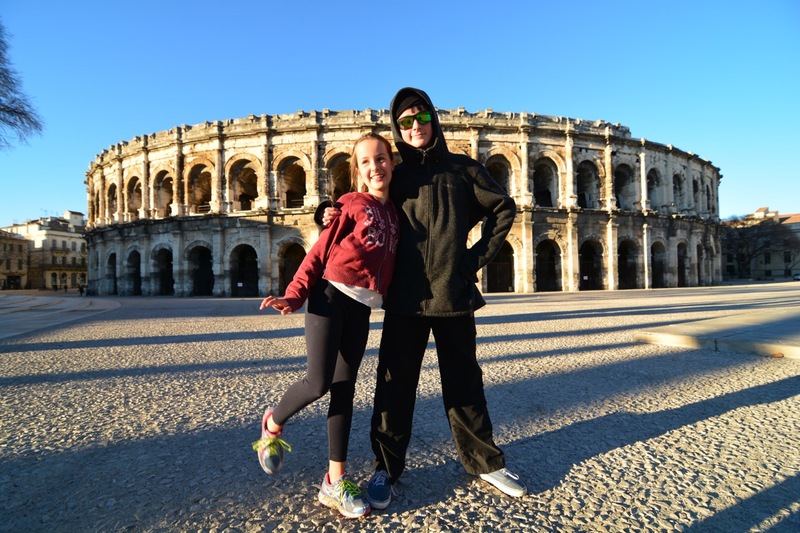 We followed up with a bit more of a Roman theme and checked out the Arena in Nimes. This amphitheatre was also built by the Romans and then fortified and used by every invading army since. Now it is home to rock concerts and a couple of bullfights (Can’t believe they still have them!) 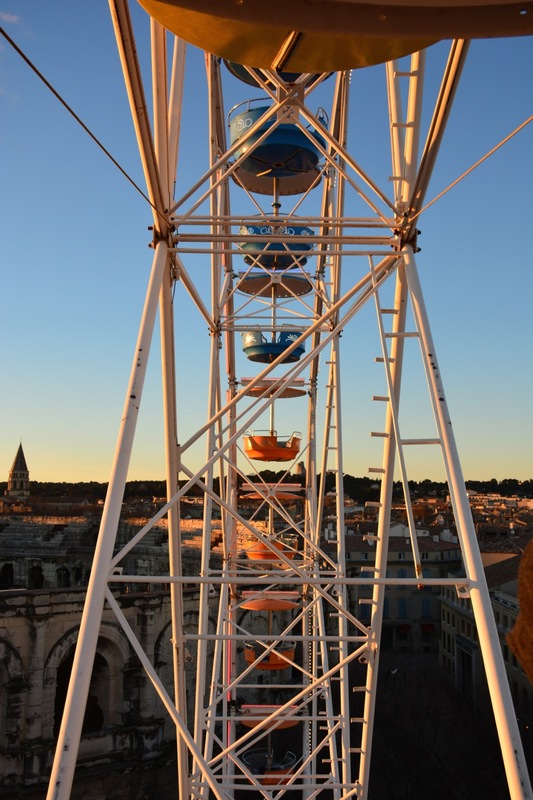 and provides a great backdrop to ferris wheel riders like us during Winter markets. 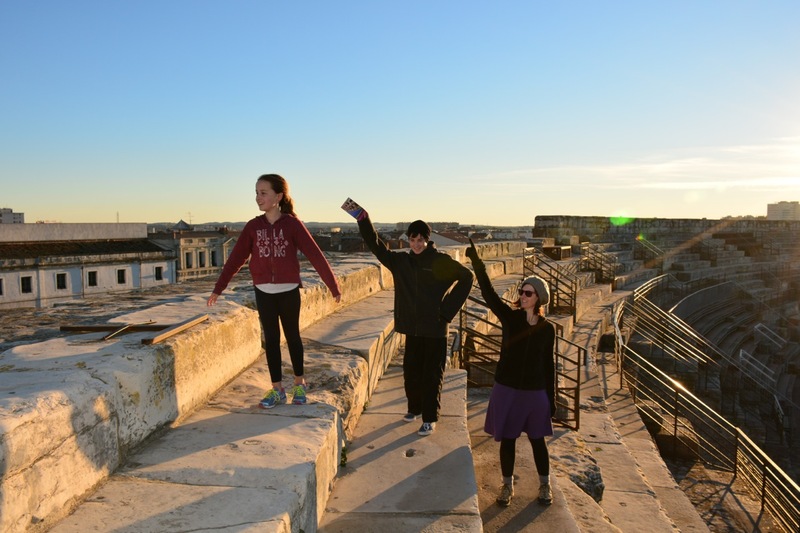 We tried to keep it a bit lazy in Avignon, as 3 of us have been staving off colds, but we did venture out one afternoon to explore the Palais de Papes for which Avignon is famous. 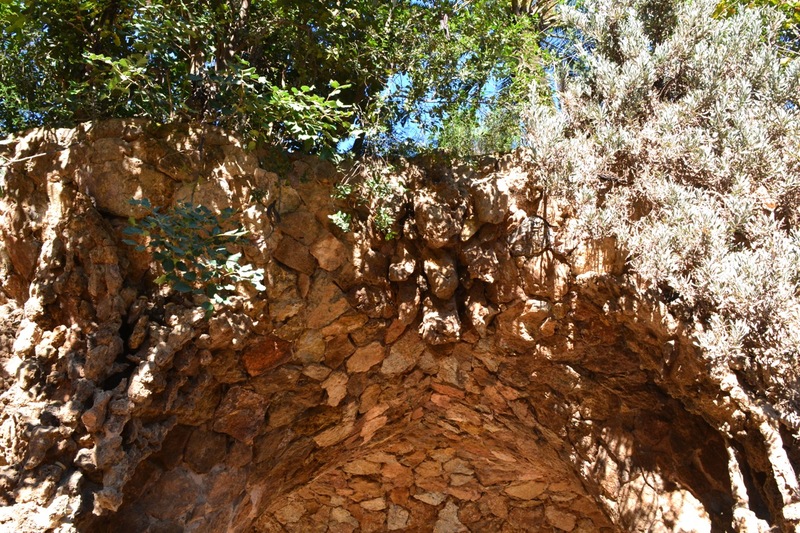 Beautifully situated on the river within the wall are the remains of the Palace. 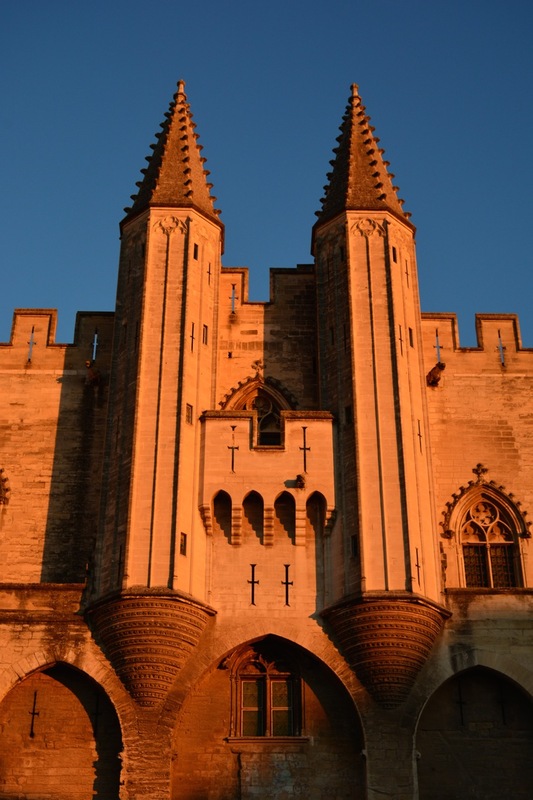 Six Papal conclaves were held in Avignon and two of the Popes lived here in the 1300s. The building has been constructed and deconstructed over time. Nevertheless it remains a really important medieval Gothic building in Europe and has been protected as a UNESCO World Heritage site. The simple, beautiful proportions of the chapel. 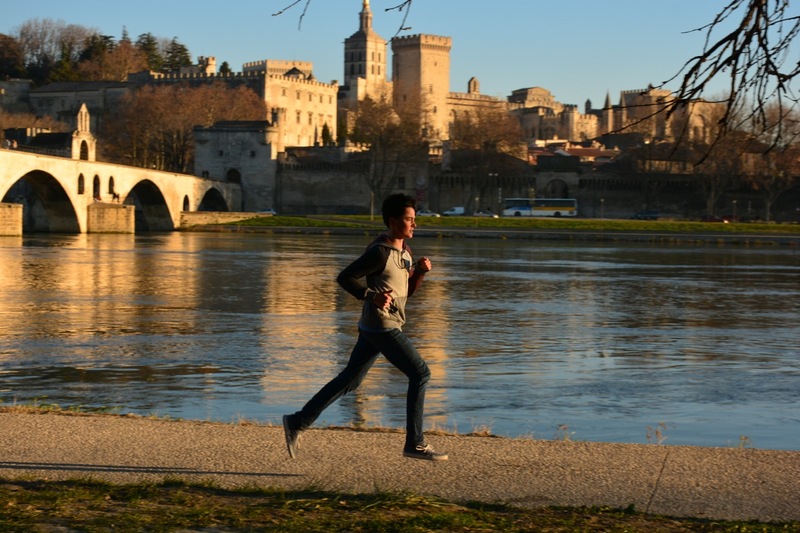 Tour de France scenery loomed large in Avignon, with the ever present Mt Ventoux rising behind the Villeneuve across the lake. With a hire car, Spike saw the opportunity to drive in the tyre tracks of Cadel and the lads up the hill, so we set out for the mountain. Firstly I will disclose that I have found being a passenger on the wrong side of the road stressful. I also admit that it was my suggestion to check at Carpentras whether or not the road was open rather than plough on straight up. Let’s face it – winds are over 90km on 240 days of the year up there. Unfortunately, the Office d’Tourisme was not quite where the Sat Nav thought it was, and tension mounted. What did stress me out completely however, was the insistence that we should perform a sharp 90 degree turn, (narrowly missing several poorly parked cars) to drive down the Rue de Observance, a 2 metre wide cobblestone path, flanked by 3 story buildings on either side, just because the phone suggested that this was the way to proceed! Turns out I wasn’t the only one. Will unceremoniously pointed out the barricade at the end of the dwindling 200m path and Spike was forced (steam coming out of the ears) to reverse up the tiny thoroughfare and begin again. 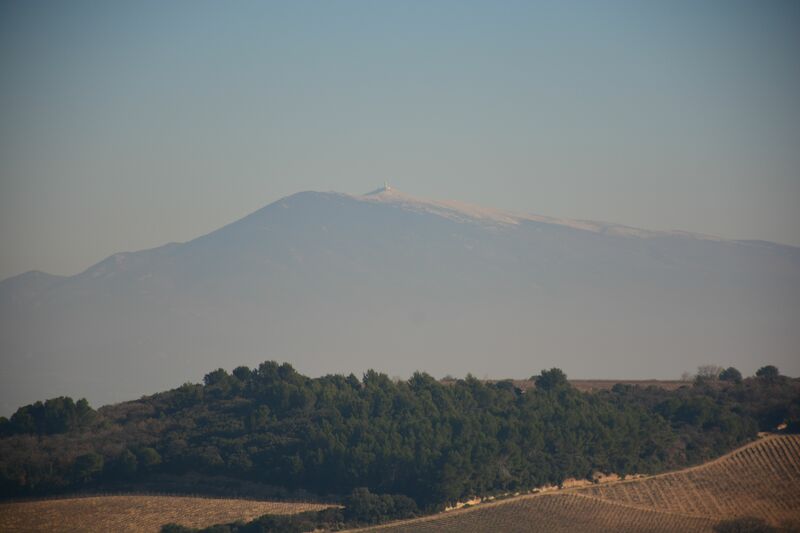 To cut a long story short, Spike did eventually find the information office and … the road to Mt Ventoux was closed. 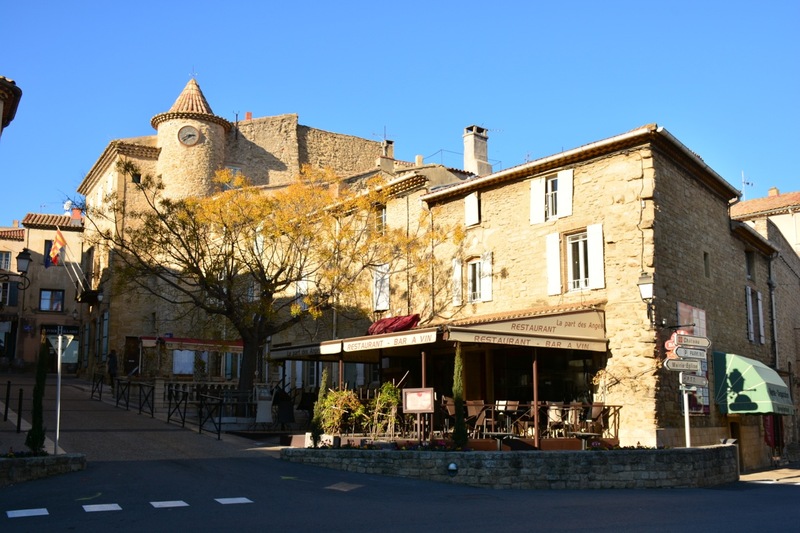 We needed a plan to re-establish calm so… instead, we visited the wine region of Chateauneuf-de-Pape. Here the big feature seemed to be large stones in the soil which cover the roots of the vines and keep them nice and warm. We ate a delicious lunch in the town, and Spike enjoyed a cellar door visit where he was able to discuss many a facet of French wine making and talk about Australia to a lovely English speaking winemaker. All this led to a much calmer journey home. 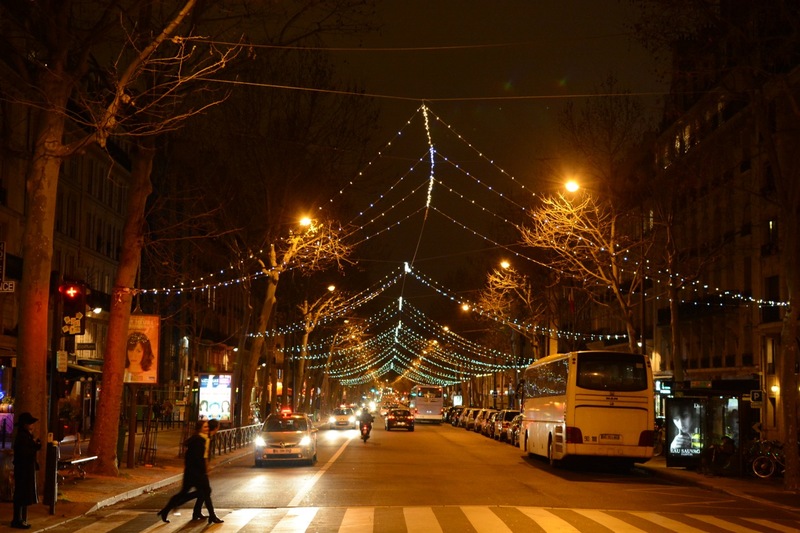 The main street of Chateauneuf-de-Pape. 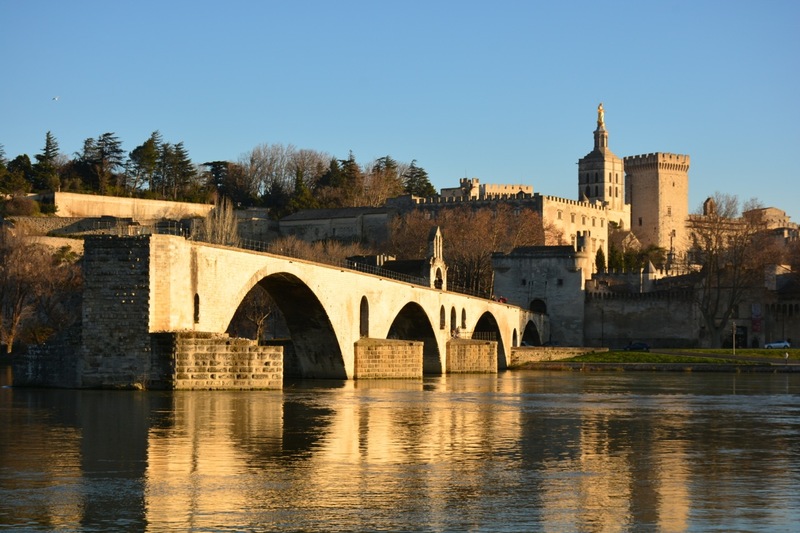 As our days drew to a close, the only thing left to do in Avignon was to wander across its own famous bridge – the one in the French children’s song. Atop the old bridge – the cobbles were riverstones. 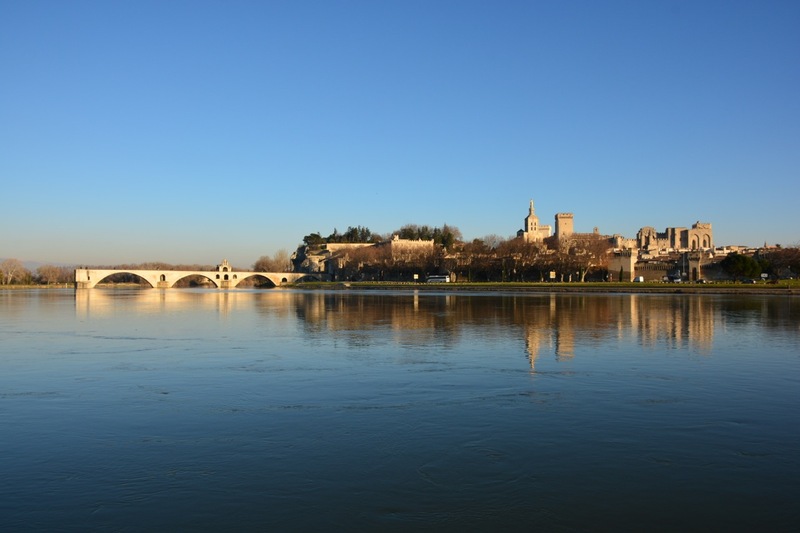 Afternoon light on the Pont d’Avignon. Louvre, 3hrs. 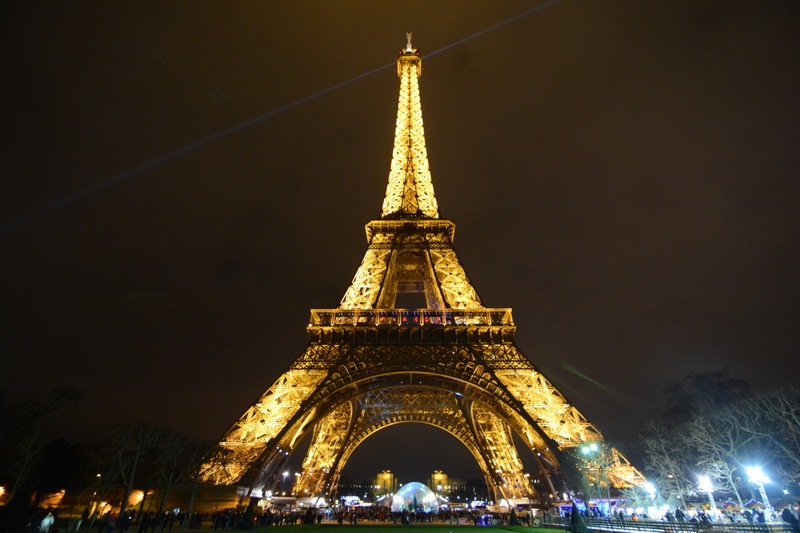 Eiffel Tower, 2 hours. Montparnasse Tower, 2 hours. Catacombs, 2 hours. 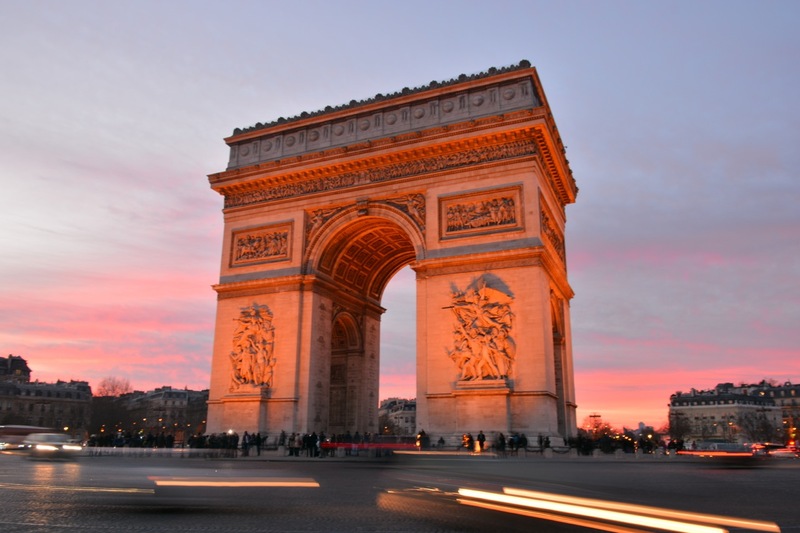 Our experiences in Paris celebrated both light and queues, leaving us with memories of the joy of evening walks and the fun of the challenge to skip the queue. 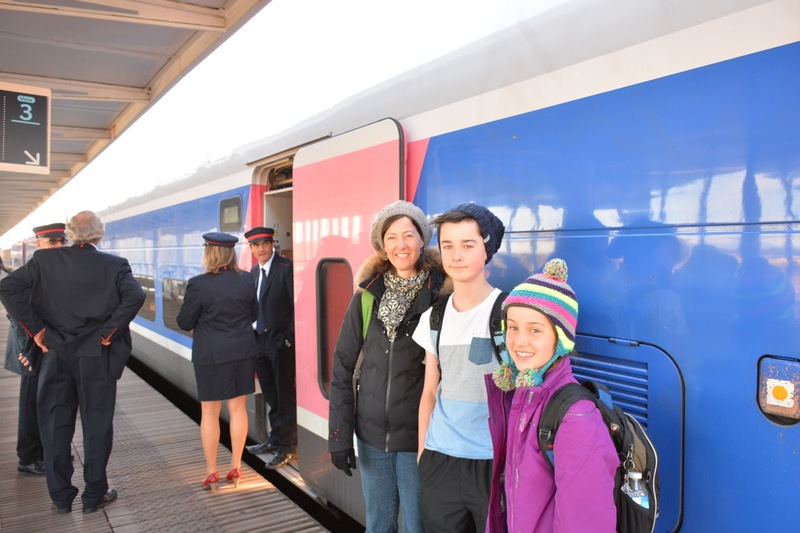 We journeyed to Paris by Eurostar. Our first train journey was a pleasure after the joys of EasyJet and budget airlines. The 2 hours from St Pancras to Gare du Nord was very civilized. Upon disembarking at Gare du Nord, we were accosted by multitudes of taxi spruikers, beggars and mostly unreadable signs. Looking at the line for the taxi, together with the small size of the taxis, Spike decided to take advantage of the spruikers, securing a ride to our St Germain apartment. However after being led away from the taxis, around a corner, across the boulevard and down a street, the rest of the family started to show signs of uneasiness (read panic). After being assured by Spike it was all good, Will made sure the “taxi” vehicle had a legitimate taxi rego sticker, then everyone relented and agreed to get into the taxi. 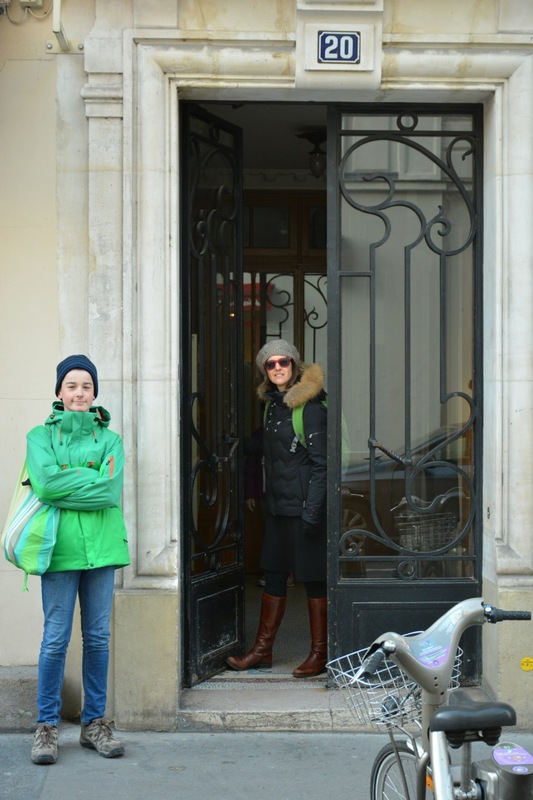 We had a great ride across the city, with Kate and Will exercising their French linguistic skills to converse with the driver and find out about Paris life. Anne, the friendly owner of the apartment, met us at check in. 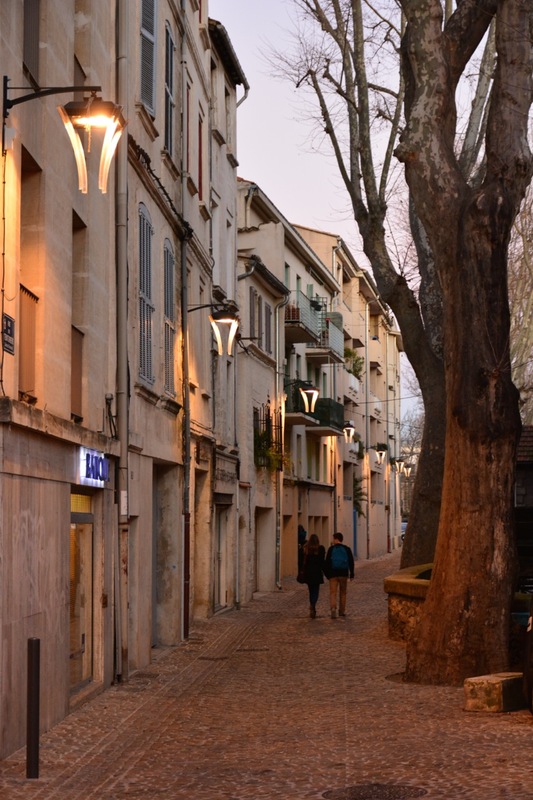 We got the neighbourhood low down, including when the local markets were open, the good places to eat and which house across the street Gerard Depardieu lived in. 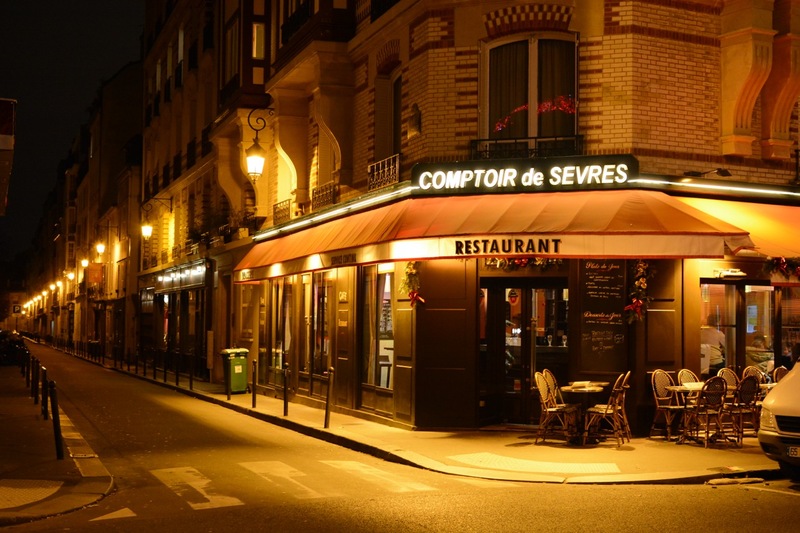 With cafés, patisseries, fromageries, and many bistros, all around the corner, we were set for the week in Paris. Rick educating us on all matters queue related! 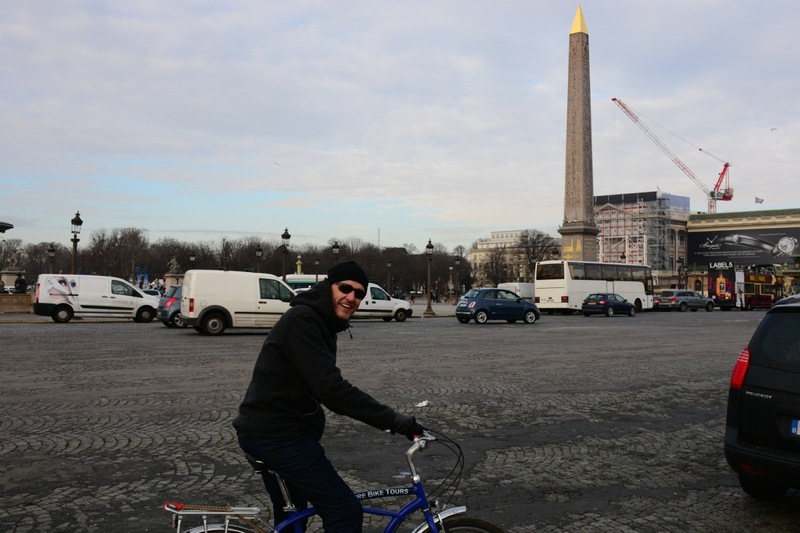 Being on a bike in Paris, leads to only one desire for me…. 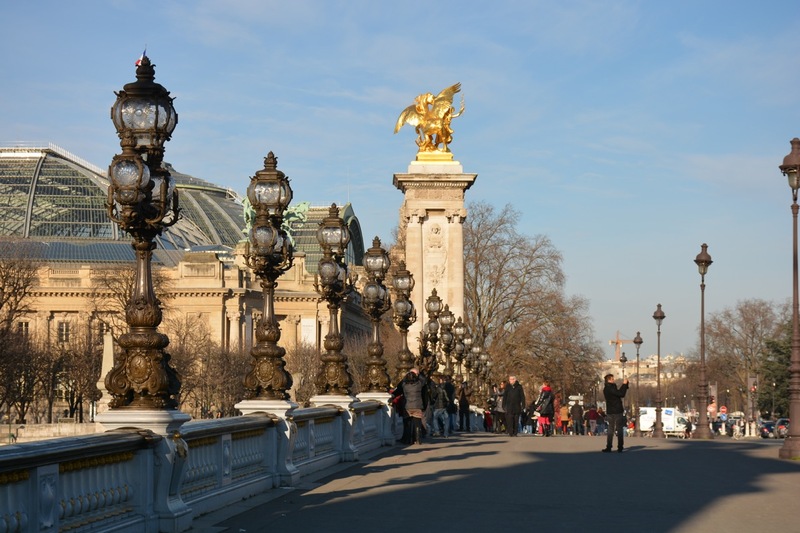 to round the Place de la Concorde and sprint up the Champs Elysees to victory. My dreams have been realized, albeit on a fat tired cruiser clothed in black rather than in yellow, although I didn’t get far up the Champs Elysee owing to the Christmas markets blocking the way. Getting set for the last corner into the Champs Elysees! 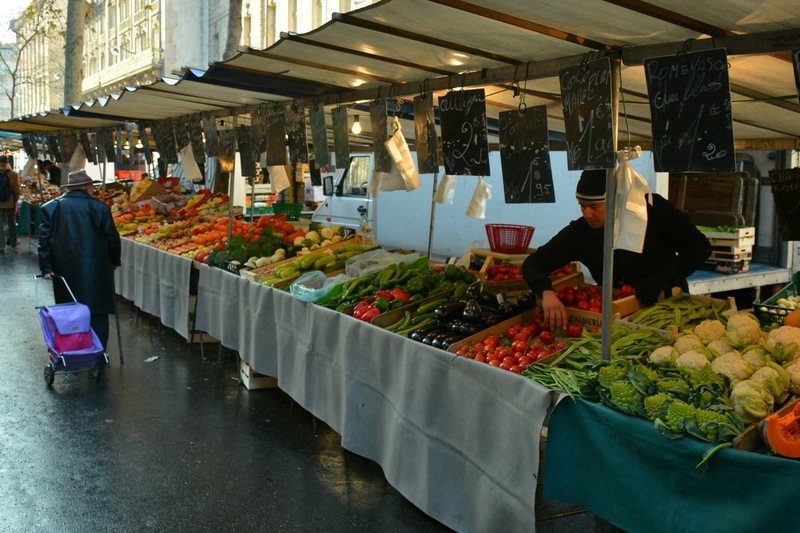 Tuesday was market day on Rue de Cherche Midi in the 6e (arrondissement). We set off in the morning to break the language barrier and buy our supplies for the week at the markets. 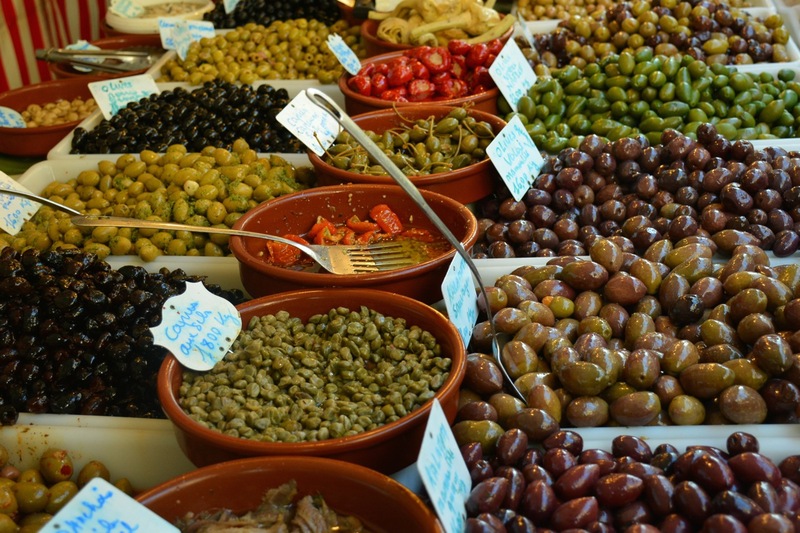 Wonderfully fresh produce of all-sorts-French was available and we stocked up on fruit, veges, meat, salmon, oysters, olives and of course, stinky cheese. 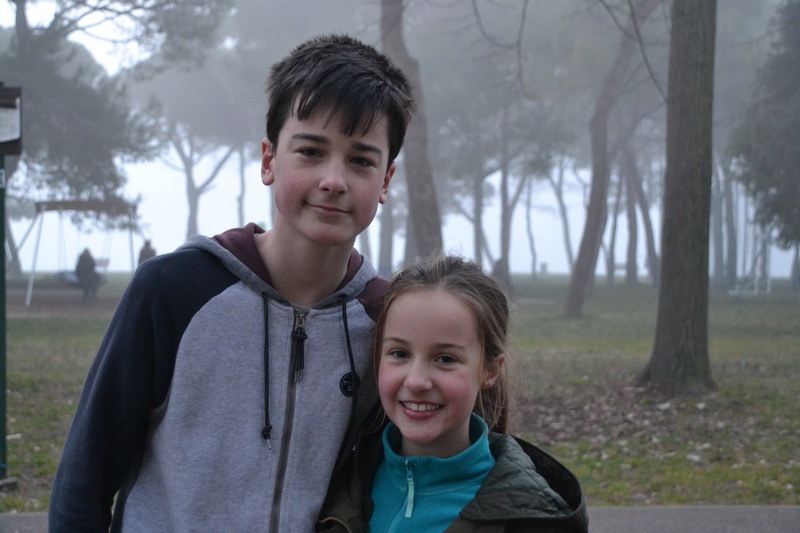 Whilst French was not Will’s favourite subject this last year, he showed that he had actually learnt something and proved to be a true proficient at making purchases, often leading the way to buy our produce. 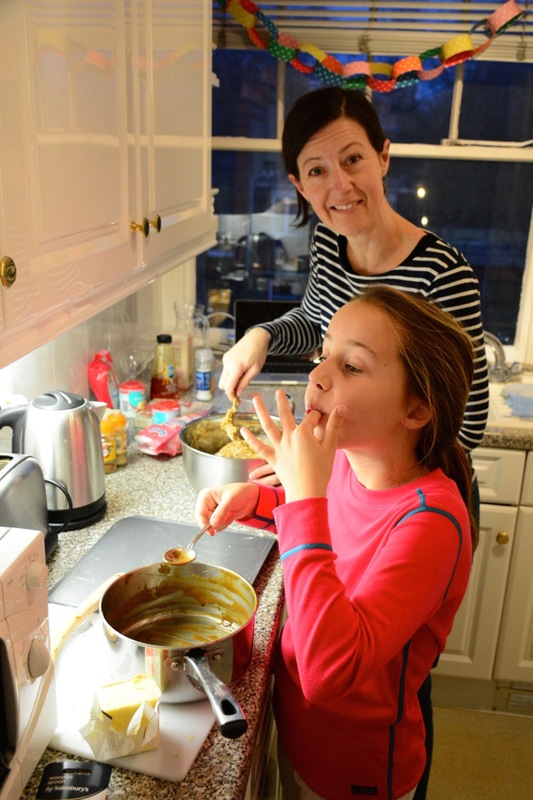 Our supplies provided wonderful home cooked meals for the week and at least a tiny sense of local Paris living. 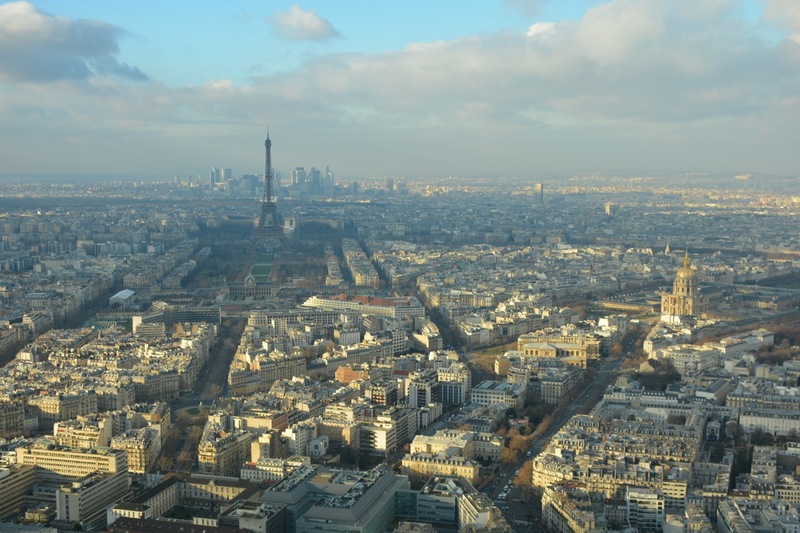 Given the sunshine, we headed down to Montparnasse to head up the tower to view Paris. 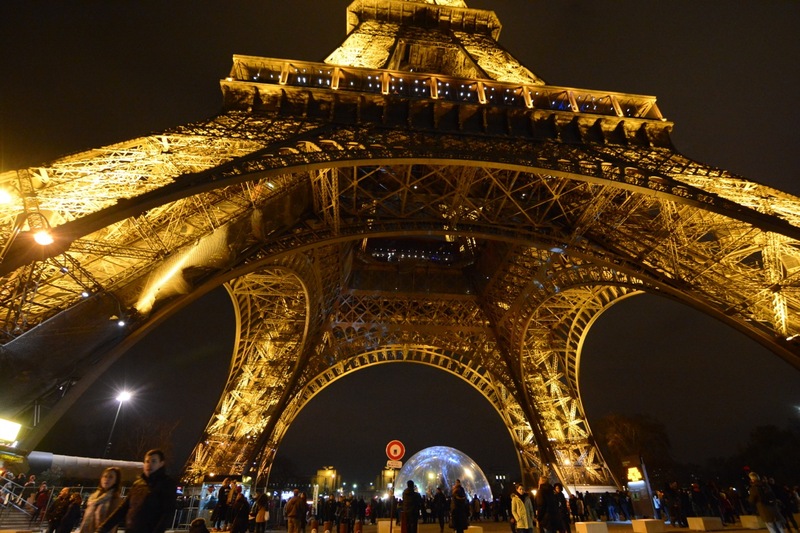 According to Rick, it has better views than the Eiffel tower and hardly any wait. When we arrived however, we found the queue outside to be enormous with about a 2 hours wait, so instead we headed off for lunch. On return, we happened upon another entrance to the tower without any queues. Wandering straight in and joining the small line at the ticket booth we soon discovered the previously mentioned queue outside the other doors behind us. As the official in attendance deemed our presence to be valid, we were up the tower in ten minutes. So, first strategy for dealing with queues applied…. Push in. Needless to say the views across Paris were pretty good. Also down near Montparnasse, are the Paris Catacombs, where over 6 million Parisiens are buried in tunnels underground. We headed down to check it out, as it was reported to be brilliant. It still remains “reported to be brilliant” as we enacted our second queue strategy…. Avoid. It was late and the queue was too long so we went home to enjoy our fresh market produce instead. Paris, City of Queues. 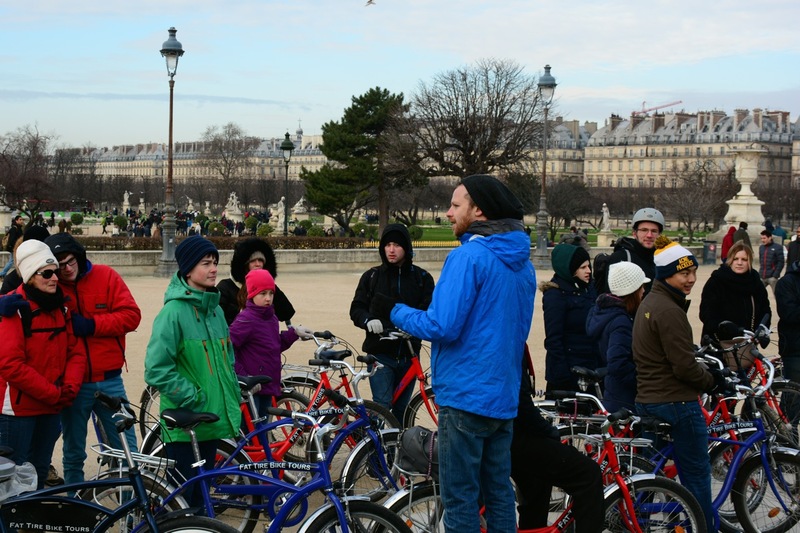 With another cracking but cold day on Wednesday, NYE, we headed out of Paris to Versailles to tackle our first ‘must do’ of Paris. The Palace was huge, the grounds were huge, and yes, the queue was huge. We headed over to the information place just outside the train station to find out about tickets. A very helpful man pointed out that the queues were already 2-3 hours long however you can pay a bit extra and join a “skip the line” tour that gets you into the palace and then leaves you to your own devices. 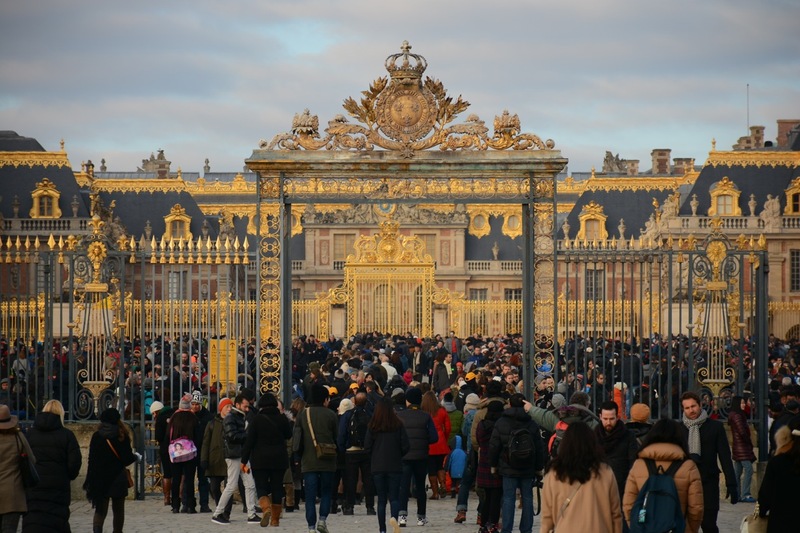 We booked for 11:45, then wandered up to stroll the amazing gardens until it was time to head into the palace. Fifteen minutes later we were inside and taking in the opulence of the various Kings Louis’. Third queue strategy adopted…. Pay Extra for a Skip the Line Tour. Happy to pay extra to skip this one! The Palace and Gardens are incredible and justifiably a UNESCO World heritage site. 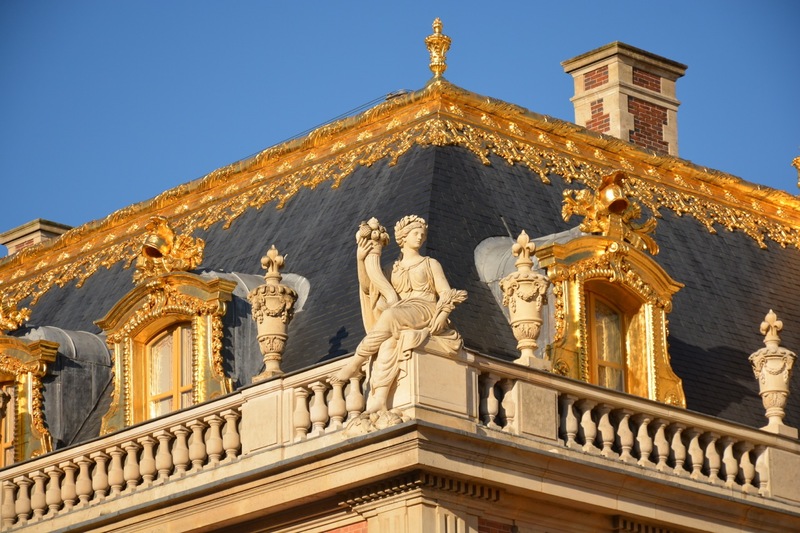 It also shines light on the egos of the Kings from Louis XIII to Louis XVI and possibly why the French revolted and cut off everyone’s head. 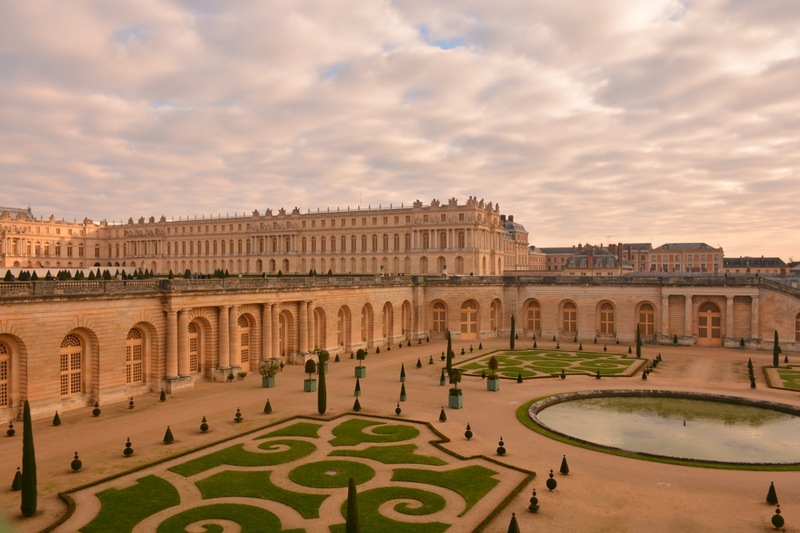 Louis XIV made Versailles the home of French Government and the town surrounds sprang up accordingly. 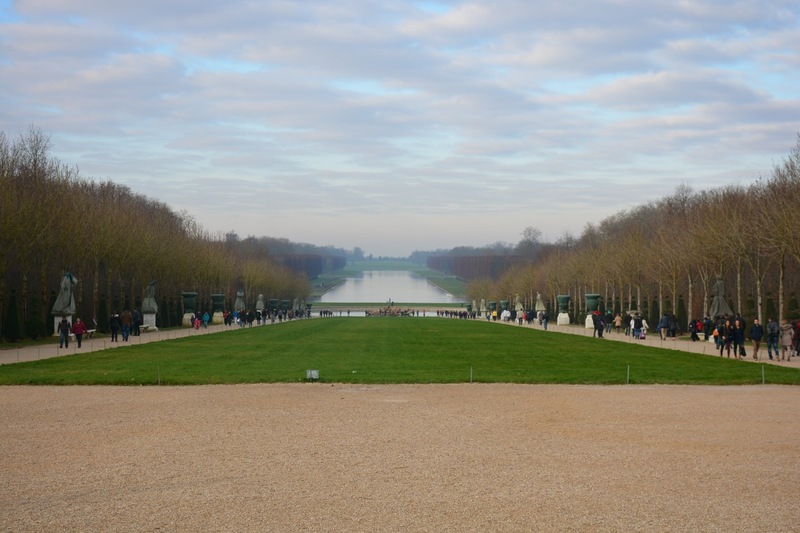 The gardens were so amazing, even in winter, showing why most formal gardens around the world are influenced by those at Versailles. 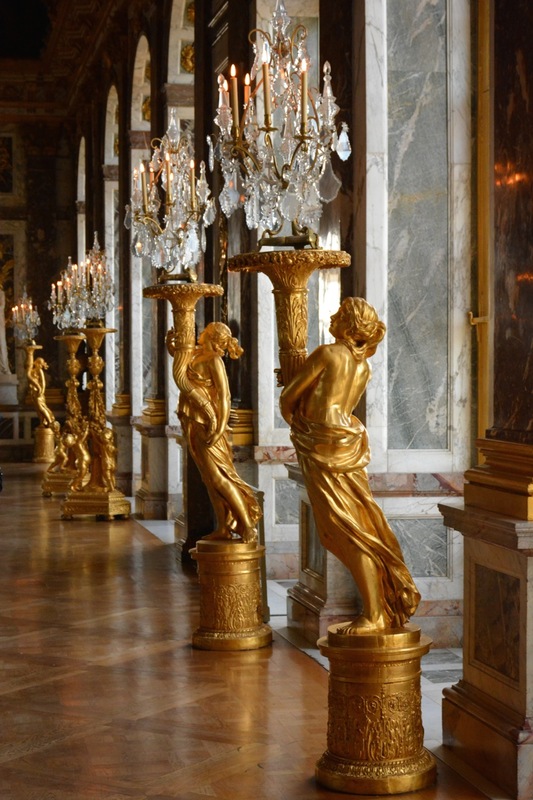 Wandering through the Palace becomes a blur after a while, with every room being overly opulent. 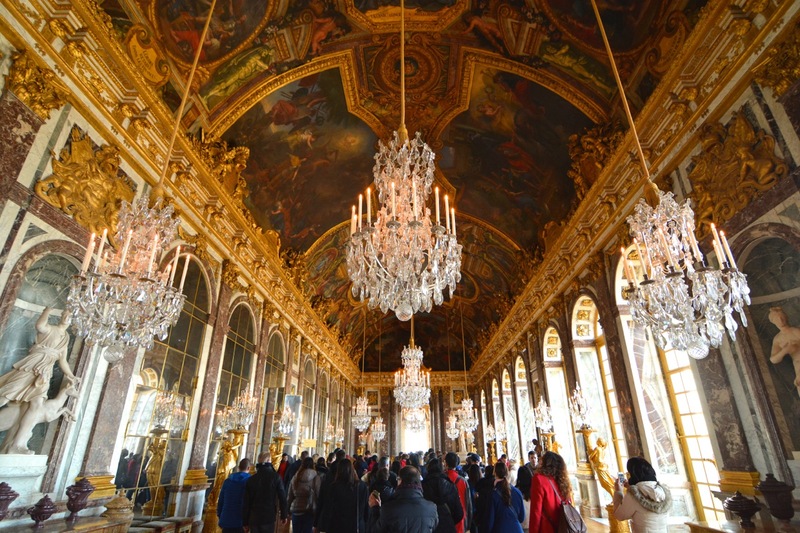 The Hall of Mirrors was pretty special and a few other rooms stood out. 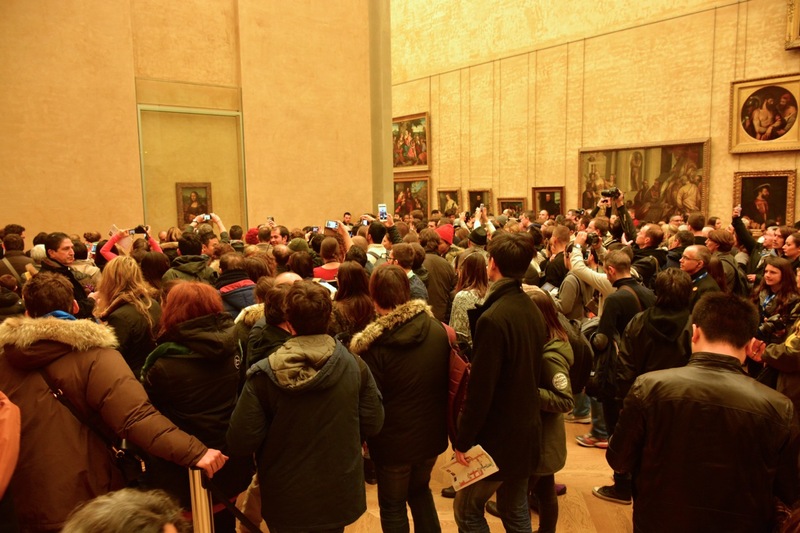 However the overall vibe was slightly diminished by the swarms of tourists like us streaming through the place, with the forest of extended arms taking selfies (exceeded only in the Mona Lisa Gallery). Paris, City of Queues. Real gold or fake gold? The pond in the front yard! 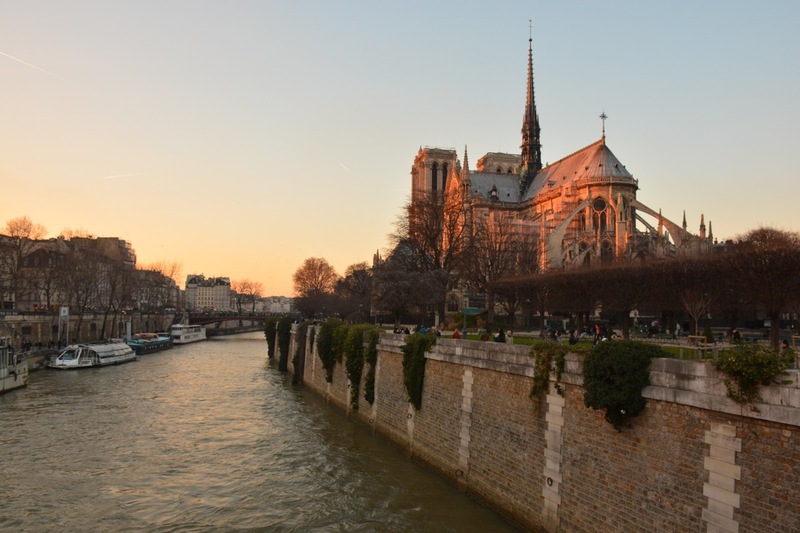 Back in Paris for NYE, we headed down to the Ile de la Cite and Notre Dame for an evening walk though the city. 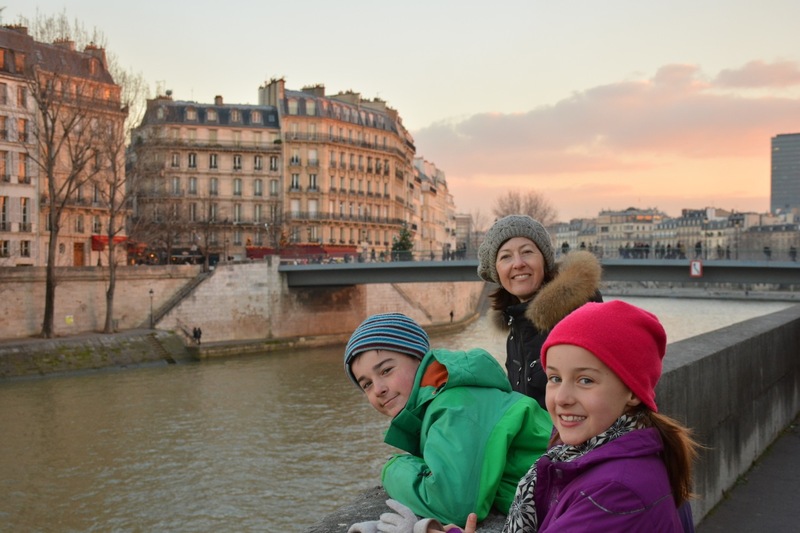 On a clear NYE night, we enjoyed a stroll along the Seine past Notre Dame and around the Ile, with the sunset and the city shining bright. Paris, City of Light. Almost freezing after dark we did not brave the Champs Elysee for the NYE celebrations, instead enjoying cards, Champagne, our market oysters and stinky cheese back at our apartment. 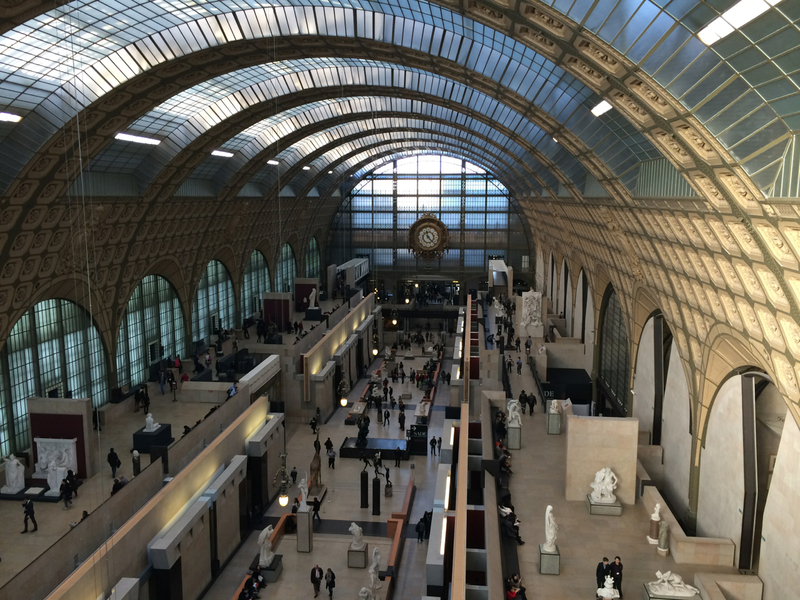 For our capital C Culture fix, we chose the Musee D’Orsay. 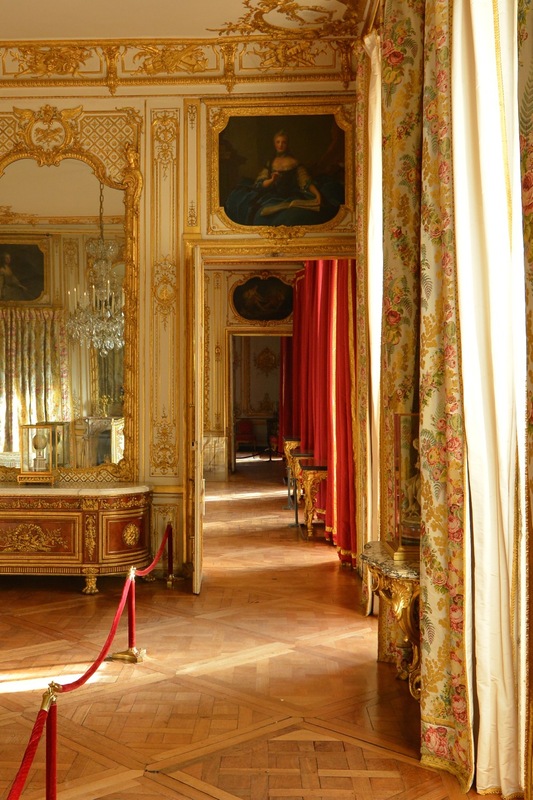 Far more manageable than the Louvre, it is able to be taken in within a few hours. Being such party goers the night before, we were able to be out by 10am, whilst the city was still quiet. Arriving at the Musee D’Orsay, we discovered it was FREE on NY day and even better, we had arrived before the crowds! Fourth queue strategy ticked off….. Beat the Crowds. But only just, as they all arrived and formed the queue an hour later. 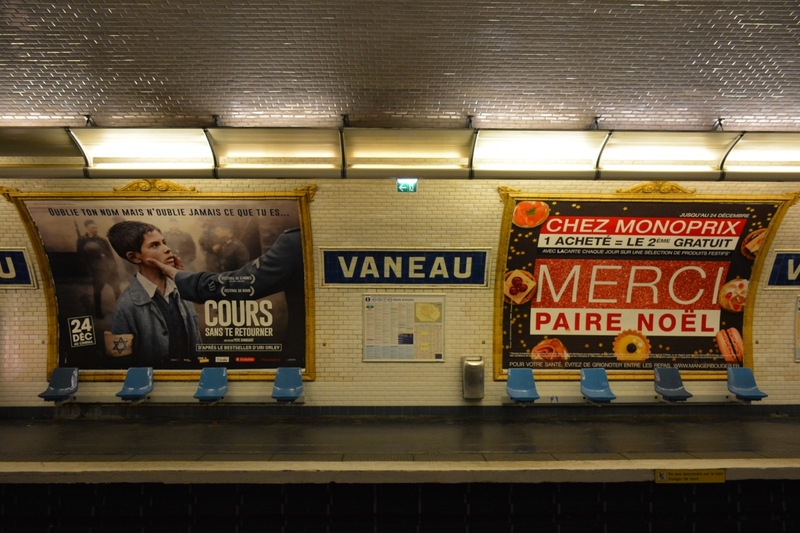 Focussing on mainly Impressionist art, the Musee D’Orsay is housed in a fabulous old railway station – very grand. In fact, New York’s Grand Central Station is modelled on the Musee D’Orsay building. We enjoyed lots of Monet, Renoir, Degas, Van Gogh, Manet, Gaugin, Pissaro and Cezanne along side others. Highlights of the 4wheatleys include Degas’ Petite Danseuse de 14 Ans sculpture (Ele), Renoir’s Dance at Le Moulin de la Galette (Kate), Van Gogh’s Starry Night (Will), Monet’s The Magpie (Kate & Spike) & Van Gogh’s Self Portrait (Spike). Culture fix done and only the Mona Lisa to be conquered. That afternoon we thought we had a “skip the line” tour of the Eiffel tower booked, but it turned out to be for the following day. Seizing the free afternoon we headed back to Pont Alexandre III to the Grand Palais for some ice skating action. Macquarie Centre Ice rink it is NOT. 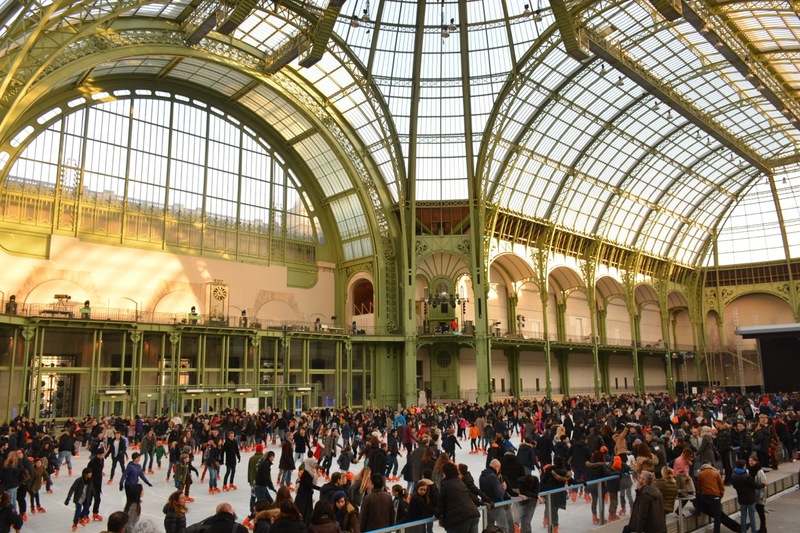 Built in the late 1890’s, the Grand Palais is a huge Beaux arts exhibition hall, and during winter it is converted to the largest ice skating rink in France. With blue skies, on this New Year’s Day afternoon, the sun streamed in through the glass roof and we had a few magical hours ice skating and drinking hot chocolates. Got a smooth action going there! 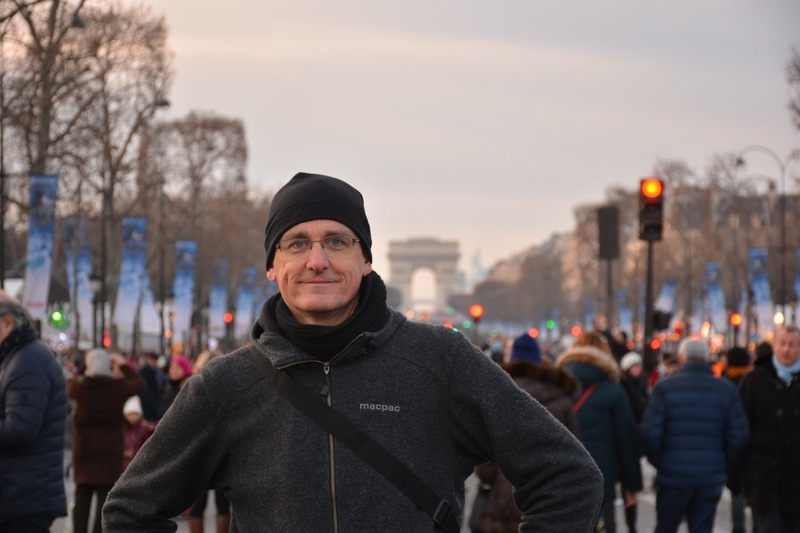 Afterwards, we strolled up the Champs Elysees, still closed to traffic for New Year’s Day, to the Arc de Triomphe. Thousands were still out, but the sun was setting and the lights came on as we strolled up the pave of the Champs, walking in the paths (tyre prints) of many Le Tour champions. 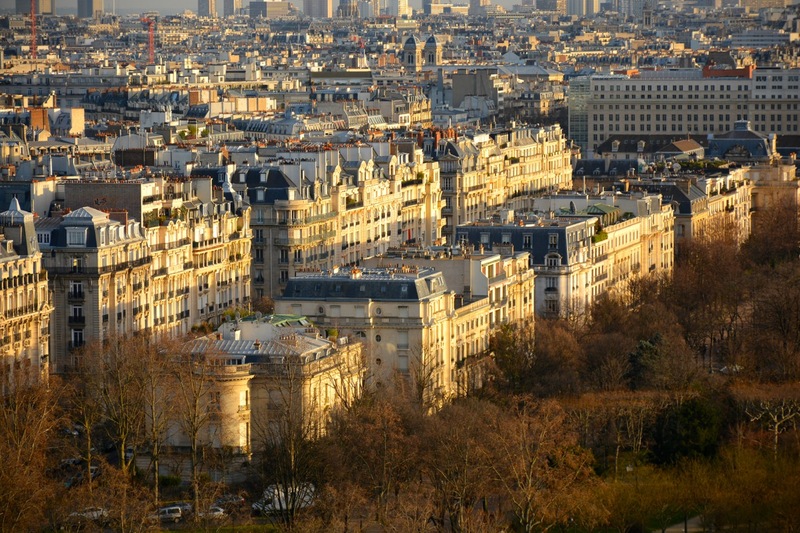 Paris, City of Light. Friday, last day. The two Paris biggies remained to be conquered. Could we do both the Mona Lisa and the Eiffel Tower in one day? 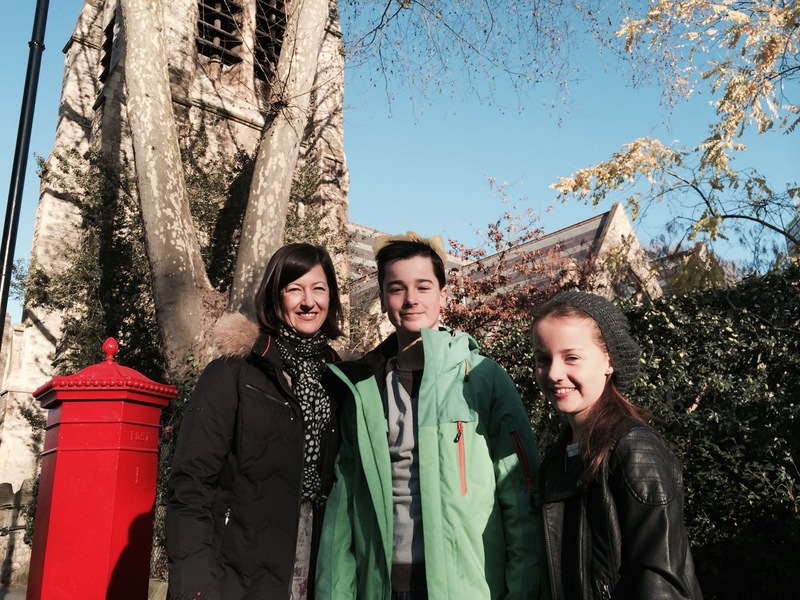 We felt that one could not go to Paris and not pay our respects to Mona. 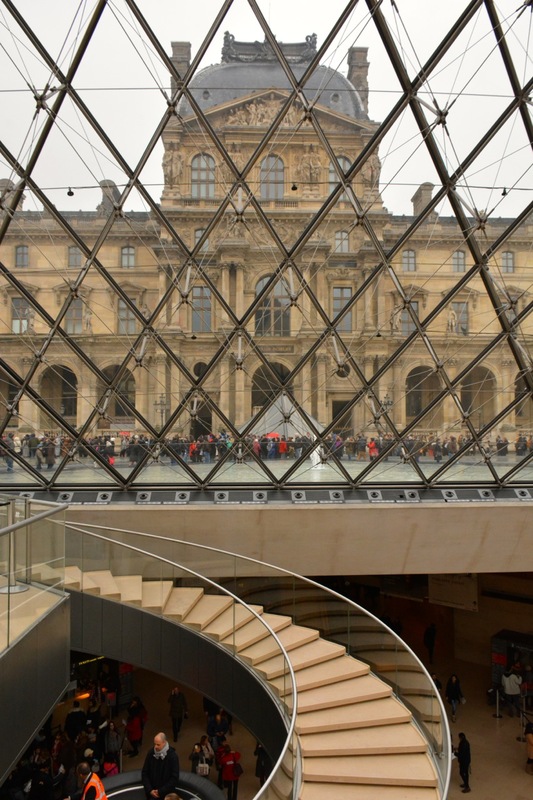 The trouble was that during this holiday week, there had been 2 hour queues to get into the Louvre. However, thanks to Rick, who gave us the tip about the sneaky side entrance to the Louvre, we conquered Louvre in 37 minutes from arrival outside, queuing, through security, ticket purchase, battling crowds to get to and at the Mona Lisa, checking out IM Pei’s pyramid and exiting out to the still waiting hordes. 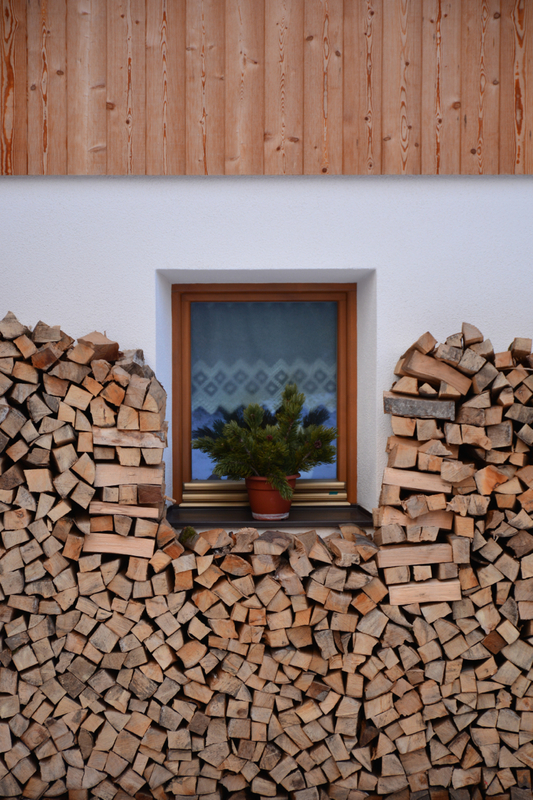 Fifth queue strategy…. Sneaky Side Entrance. Check! How was Mona? We got to within about 5m of the painting, barred from closer viewing due to the crush of tourists. We managed to catch a glimpse amidst the good ole’ forest of raised arms holding phones, cameras, iPads, videos etc. With Mona hung behind a glass screen, it appeared no different to a framed print. Maybe it was just that we didn’t get close enough. 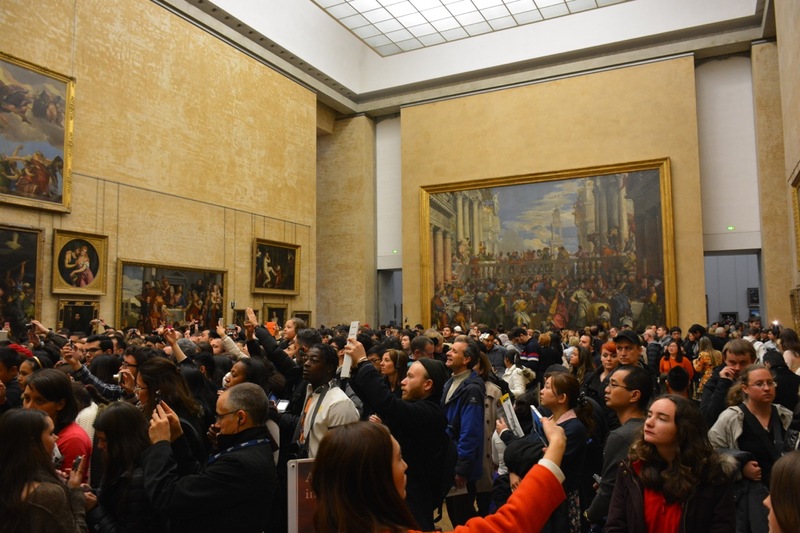 It was a stark contrast to the intimacy of the the Musee D’Orsay where you can literally put your face right up to a Renoir, Monet or Van Gogh masterpiece and truly take in those paintings. Paris, City of Queues. 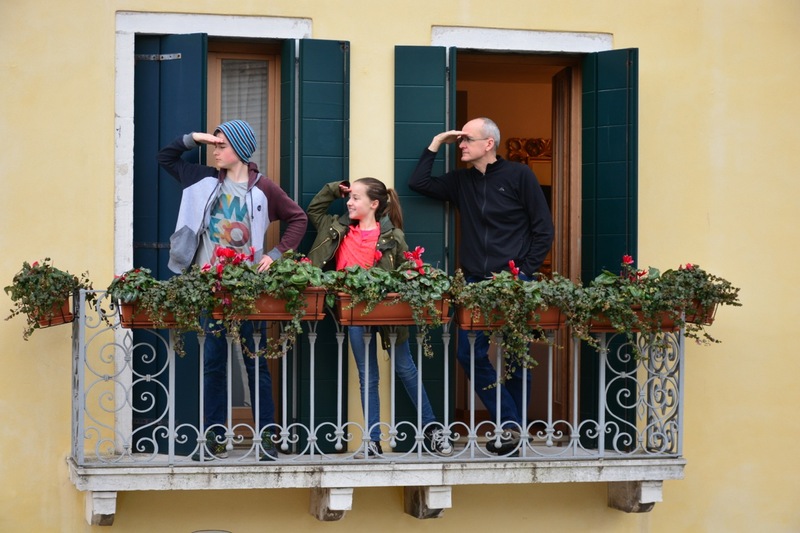 I think there is something on the wall over yonder. In via the sneaky side entrance, out via the front door. 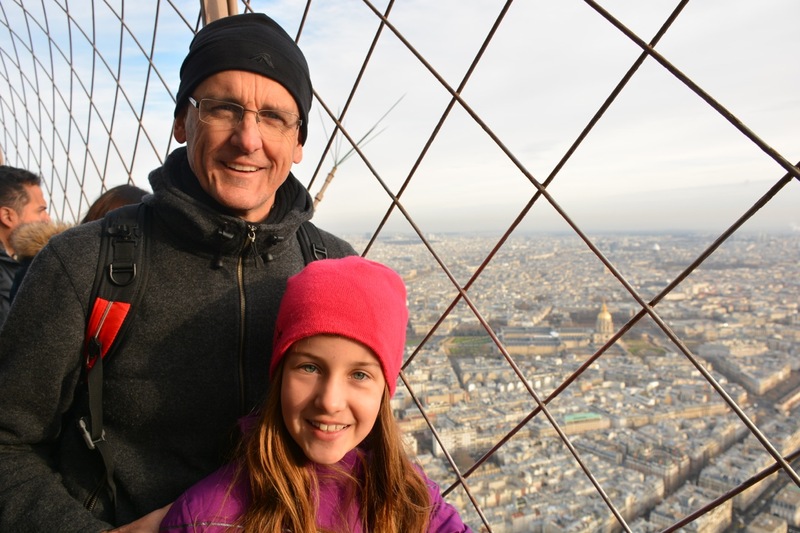 We spent our last afternoon in Paris on the Eiffel Tower. The sky cleared for the afternoon, leaving us with a couple of hours visiting each level from the top down. We caught the lifts to the “sommet”, took in the views and headed down to levels two and one. 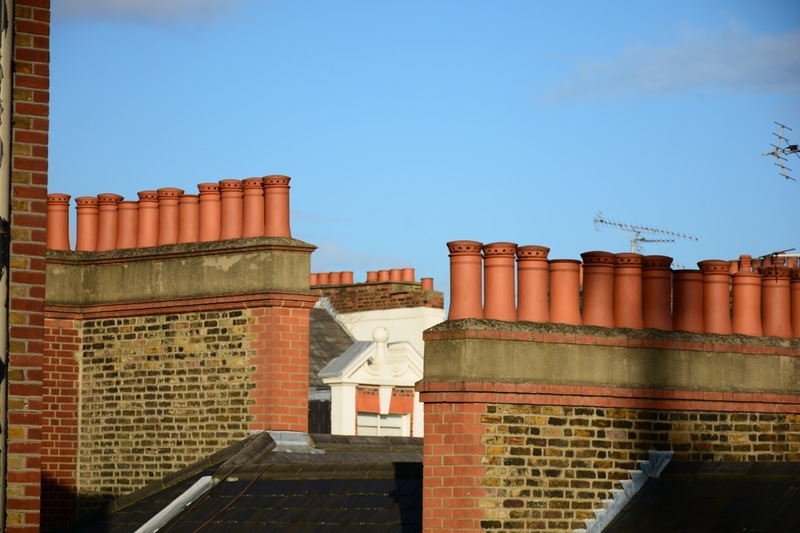 We enjoyed the views from the lower levels the most as they are closer to the Paris buildings and streets. 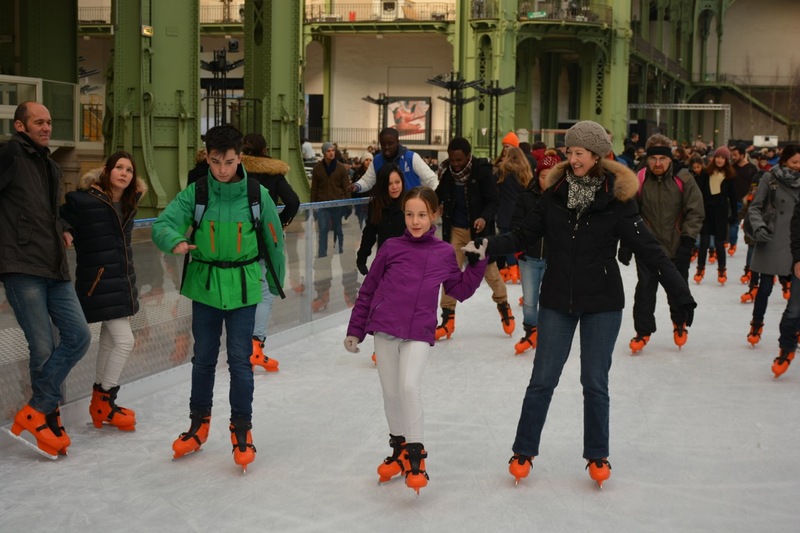 Apart from restaurants, cafes’ and souvenir shops, the Tower hosts an ice skating rink. 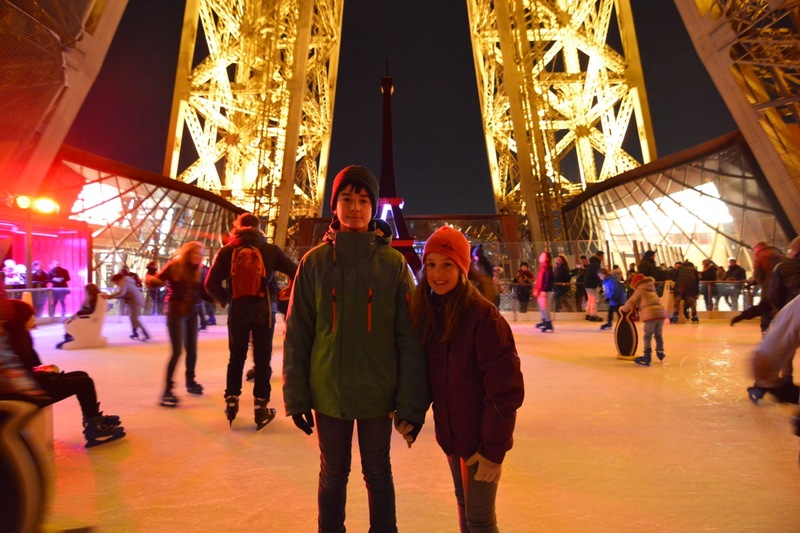 So what better way to spend the evening than to ice skate on the Eiffel Tower? Whilst we waited for the operators to do the afternoon ice refresh (the wait was literally watching water freeze) we caught the glow of the sun as it set and then watched as the lights came on over the Tower and Paris. 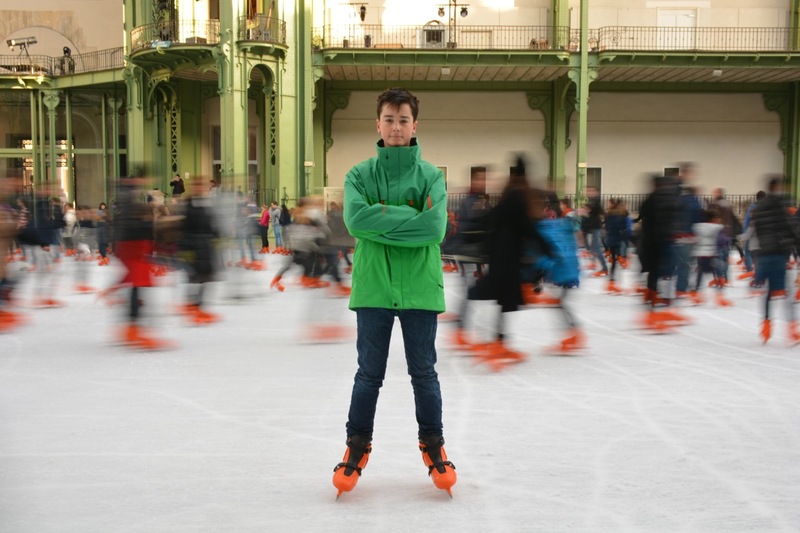 The kids finally got their skates on and glided around on a bright and sparkling Eiffel Tower. 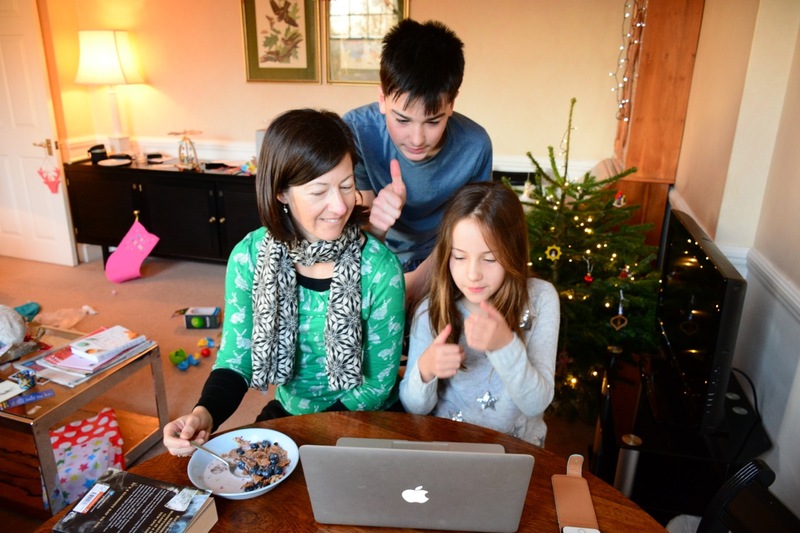 A movie – thank you technology elves. Yes – Spike was there! Family shot. And a hearty soup for dinner by candlelight. 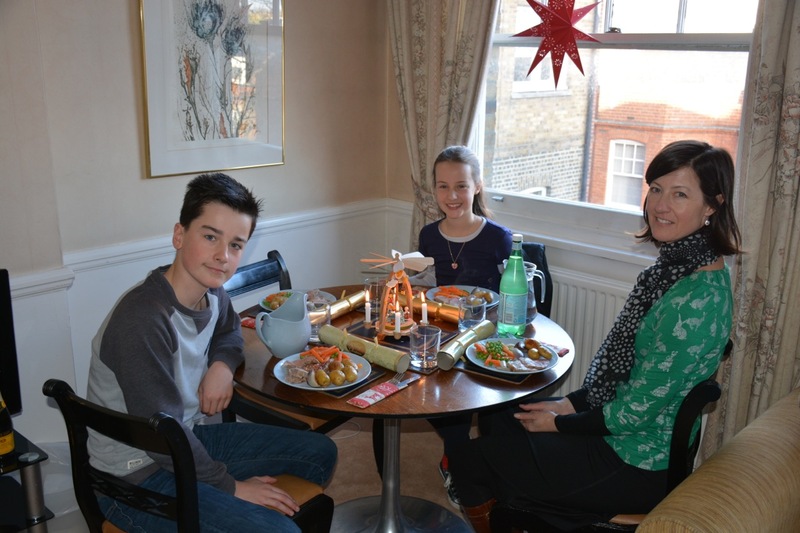 Weren’t sure how we’d go – but we made the most of our Northern Hemisphere Christmas and we will remember it fondly. 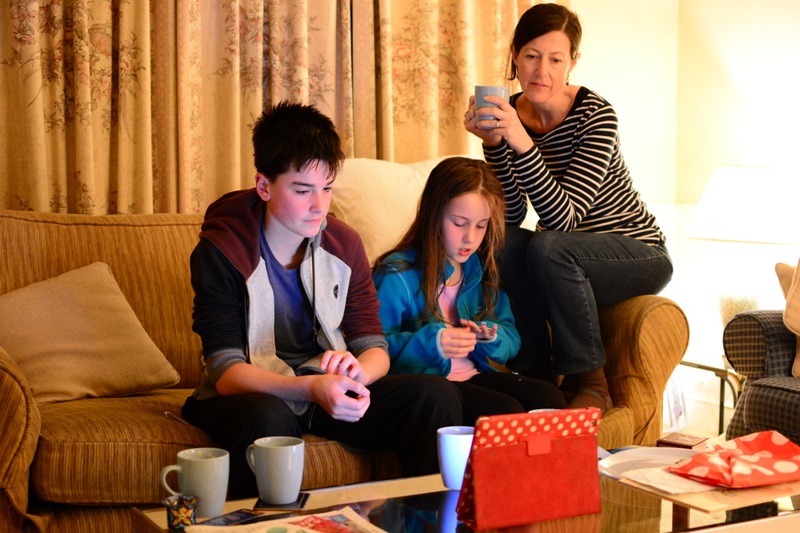 While we are mainly writing here to keep a record of this trip, we know that family and some friends are reading. 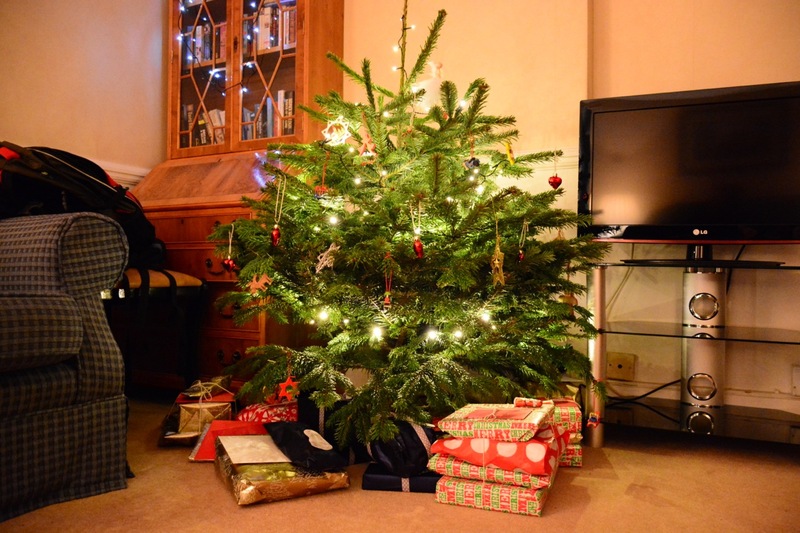 We hope that you had a wonderful Christmas and wish you a very Happy New Year. May 2015 be healthy and full of love and new adventures.